Articles that have appeared in Allied Press publication Otago Daily Times from January 2011. Otago Settlers Museum organisers are keen to further develop a popular chindogu exhibition which has been running at the museum, in association with the 2011 Dunedin Fringe Festival. The show features inventions based on the strange Japanese art of chindogu. These devices aim to make everyday life a little easier, but are so impractical they are almost useless. At a settlers museum board meeting yesterday, member Richard Thomson referred to the latest annual show, which runs until April 3. He noted the success of Steampunk activities in Oamaru and said the chindogu show in Dunedin could be further developed as an attraction that would “catch the imagination of a different group of people”. He suggested adding to the show some early invention-related patent applications, which could provide a link to early history. In Oamaru, several activities, including a Steampunk fashion parade and gala ball, involving a quirky Victorian science fiction approach, have been organised by an award-winning group, the League of Victorian Imagineers. During yesterday’s meeting, another museum board member, Lee Vandervis, said the Steampunk spirit shown in Oamaru could also be adapted to promote Dunedin’s industrial heritage. He planned to discuss the idea with the Dunedin Gasworks Museum organisers. Commenting in a later interview, settlers museum director Linda Wigley said she much admired the creativity generated by both the Dunedin chindogu show and the Steampunk activities. Care was needed to ensure there was no accidental treading on the toes of the Oamaru Steampunk organisers. She noted Mr Thomson’s comments and was also enthusiastic about further developing the chindogu show. Dunedin’s new earthquake policy got the go-ahead from the Dunedin City Council yesterday; now it is the turn of the public, and the building owners who may have to pay to strengthen the city’s building stock, to have their say. At a full council meeting yesterday, councillors declined to increase the level of strengthening required from 34% to 67% of new building standards, with the latter figure agreed to be outside the ability of most owners to pay. Consultation is expected to begin next month, with hearings in August and the new policy in place by November. The council’s dangerous, insanitary and earthquake-prone buildings policy was introduced in 2007, with a review planned for 2012, but a decision was made to complete the review early after last year’s Christchurch earthquake. The draft policy, released last week, would result in the setting up of a database of earthquake-prone buildings, and owners given two years to provide evidence their building was not earthquake-prone. The policy included a proposal for incentive funding of $200,000 a year from 2012-13, with a phased increase to $400,000 after 2015-16. A report to yesterday’s meeting from heritage policy planner Glen Hazelton and chief building control officer Neil McLeod recommended the level of strengthening remain at 34%, but that the council encourage owners to strengthen to 67%. “This approach recognises the fact that although 67% is a desirable level, the costs of meeting this level of strengthening for many building owners will be prohibitive,” the report said. For heritage buildings, it could have “a highly detrimental impact” on their character. At yesterday’s meeting, Cr Fliss Butcher called for “option two” in the report, which included the requirement to strengthen to 67%, to be approved. While she later agreed to the 34% option, she said she was “of a mind to say it’s not enough”. There were too many buildings in the city that would fall down and kill people in an earthquake, she said. The city, though, did not have the “zillions of dollars” needed. Cr Jinty MacTavish said while 34% may not be as strong as some may want, “we live in an imperfect world”. Deputy mayor Chris Staynes said even Christchurch had not gone with the 67% figure. He said earthquakes were an emotional issue, but the policy was “a good, steady way ahead”. Cr Staynes noted the policy would target the strengthening of parapets, roof-level structures and verandas on historic buildings along key pedestrian areas of George and Princes Sts, and apart from the buildings that failed in Christchurch, it was falling masonry that had caused fatalities. The council also voted for a recommendation from Cr Kate Wilson that herself, as planning and environment committee chairwoman, Cr Lee Vandervis, as heritage buildings economic reuse steering committee chairman, and an appointee with an engineering background make up the hearings committee for consultation. Calls for more city councillors to be included in a new group to liaise with the Dunedin City Council’s council-controlled organisations (CCOs) has been rejected, prompting criticism from some councillors. Plans for the group were first debated at a finance, strategy and development committee meeting on March 14, and approved after a fractious debate at yesterday’s full council meeting. The group would comprise Mayor Dave Cull, deputy mayor Cr Chris Staynes, acting chief executive Athol Stephens finance, strategy and development committee chairman Cr Syd Brown and his deputy, Cr Richard Thompson. Members would not have decision-making powers, but act as a conduit between the wider council and the CCOs, such as when the need arose to discuss commercially sensitive matters at short notice, a staff report said. Speaking at yesterday’s meeting, Mr Cull said he had – following a request at the March 14 meeting – agreed to consider allowing other councillors to also attend the group’s meetings, without speaking rights. However, advice from Dunedin City Holdings Ltd and CCO staff was that a larger group at meetings could stifle “full and frank” discussion, making the meetings “pointless”, he said. He was therefore of the view the new group should remain limited to those already named. That prompted protests from Crs Lee Vandervis, who labelled the move “anti-democratic” and the group “a political cabal” designed to prevent some councillors – including himself and Fliss Butcher – from asking questions. “The only reason for the existence of this political group was to be politically selective about who is allowed to speak to our CCO [staff]. “I think it’s vital we vote this out and vote democracy in,” he said. Cr Fliss Butcher also criticised the restrictions as “disgusting”, saying councillors were all elected equally. “I think this is an absolutely undemocratic thing to do,” she said. Mr Cull said any councillor remained free to question any CCO staff member outside the meetings, but the selection process for the group was based on council positions – not individual personalities. Involving all councillors, while it might “appear ideal”, would have been unworkable, he said. The group won support from Cr Thompson, who said that far from taking something away from councillors, the new group would only add to processes already available to scrutinise CCOs. “It does not change in any way whatsoever the access councillors currently have,” he said. Councillors voted 8-3 to establish the group, with Crs Butcher, Vandervis and Teresa Stevenson opposed. Crs Paul Hudson, the DCHL chairman, and Kate Wilson, a director of Taieri Gorge Ltd, both withdrew from the vote. 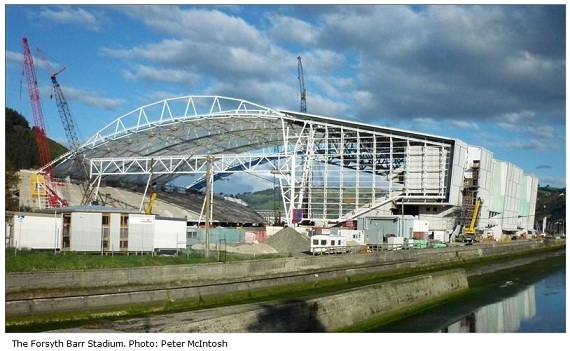 Construction at Dunedin’s Forsyth Barr Stadium may be rapidly reaching a conclusion, but in the shadow of the structure, the financial debate and the entrenched political tensions, continue. Dunedin City Council reporter David Loughrey explores why an extra $5.1 million funding was granted for the stadium this week, and finds some differing views. A report that went to the Dunedin City Council’s finance, strategy and development committee on Monday had a title that made something of a statement. The report was called “Forsyth Barr Stadium Base Building Further Requirements”, but whether the requirements were further to the base build is a matter of some contention. Angry texts were sent, Mayor Dave Cull was accused of “talking out of school”, and the word “integrity” was used in public. The stadium debate is back, and the council appears to be “up to” $5.1 million worse off. It relates to a list of items said to be “excluded” from the guaranteed maximum price (GMP) budget for the stadium. 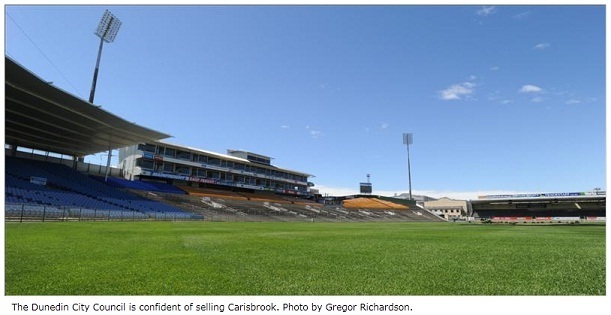 In April, 2008, the council received four peer reviews of the Carisbrook Stadium Trust’s investigations into the stadium, ordered so councillors could get an independent assessment of the trust’s work. Davis Langdon was asked to review progress made by the trust, and it was the reviewer’s report that first coined the term “exclusions” to describe what was considered to have been missed from the project’s planning. Asked in 2008 to respond to the report, CST chairman Malcolm Farry said the kitchen fit-out would be the responsibility of whoever took a contract to run the facility, a situation he said was “very commercially common”. But on Monday, at a non-public meeting of the council, “up to” $5.1 million was granted to Dunedin Venues Management Ltd for some of those items. Mr Cull thought so. He said this week in his opinion the items funded were not “extras” for the stadium, but aspects that should have been in the project from day one. The guaranteed maximum price was “waved at the community and the council”, but the items funded were dropped from the budget to keep it at the level promised, he said. The CST had originally expected a $2 million contribution from the caterer who took the tender, a figure borne out in the report to Monday’s meeting. DVML was provided a kitchen “significantly more advanced than New Zealand benchmarks”. The contractor DVML was talking to had been willing to put in $3 million – a matter again backed up by Monday’s report – but a further $2.4 million was still needed. They were only used a few times every year, and the CST considered with sponsorship and advertising, the screen could be a “neutral” cost. “DVML have explored it and decided they could make money if they owned it themselves. “This strategy was not successful,” it said. Mr Farry said the signs were seen as “a significant advertising and sponsorship opportunity”. He accepted times were different than they were four years ago, but he still felt they should have been covered that way, as they were “clearly the responsibility of the naming rights sponsor”. He said the telephone exchange noted but not funded by Monday’s meeting was not an issue for the builder of the stadium, and a wifi system, also noted, was a technology that had not advanced to the stage ithas now when the stadium was designed. Mr Farry said the CST had benchmarked the stadium against others in New Zealand and Australia, and “undertook to be at least equivalent, and superior in many respects”. “We’ve had to do that on a prescribed budget. But Mr Cull said he believed money was “taken out” of the kitchen fit-out to save the GMP. “Setting up a kitchen is complicated, till you have a [company] that knows what they want, and what we want of them. “I acknowledge it’s difficult to say `this is how much we need for the kitchen’. During the week, several councillors have noted the “up to” aspect of the resolution to provide “up to” $5.1 million. “DVML may not earn money from that, but to have games in the city will provide considerable economic input. And if the stadium was not finished, “the costs would still carry on”. On criticisms he was holding meetings on the stadium with the public excluded, he said he had been behind the decision to make the list of “extras” public. “I had been asking for some time [to get the list and the costs] but I did not get it. By email, he said each item had “a unique set of issues to be worked through with suppliers”. A”Dunedin digital office” approved this week is expected to cost the city up to $325,000 and add two staff members to the council’s books. But Mayor Dave Cull has argued the cost must be borne to make sure other New Zealand cities did not get “way ahead of us” in digital development. Establishment of the office, agreed to at a finance, strategy and development committee meeting this week, is part of the council’s digital strategy, which was driven by Mr Cull when he was a councillor before the most recent election. The strategy included 10 projects to develop a “digital Dunedin”, including a wireless service across the central city and outlying suburbs, a Dunedin city portal to integrate information in a single entity, and a computer club house to provide digital access for those without it. The strategy was planned to work alongside the Government’s national deployment of broadband infrastructure. The council funding of $125,000 agreed to on Monday was subject to the approval of the next full council meeting, and $100,000 a year for the 2012-13 and 2013-14 financial years was subject to “external support”. A report from deputy mayor Cr Chris Staynes said the office would implement projects, work with community groups and deliver the strategy’s goals. It would require an annual budget of $250,000 to $300,000, which would include the cost of two staff members. The strategy steering group would approach funding organisations and businesses to secure most of the funding, but it needed a financial commitment from the council. Early indications were “a number of significant businesses” would contribute and it might have a community organisation as a major sponsor. Cr Staynes said after the meeting the steering group would begin work quickly and the office was expected to open before July. The plan did not get full agreement at the meeting. Cr Fliss Butcher asked what the office would actually do, suggesting a “digital office” was an oxymoron, and Cr Teresa Stevenson argued staff already at the council should take the positions on offer. Mr Cull became clearly exasperated by what he described as “relitigation” of a strategy already agreed to by the council following consultation and hearings. Council staff already employed had neither the time nor the expertise to do the “advocacy” role intended. Organisations such as the University of Otago, the Otago Polytechnic and the Community Trust of Otago were keen to be involved, but were not prepared to do the work on their own. “I can’t emphasise enough how important this is,” he said. It was essential for the education and health sectors, and the economic development of the city, he said. Developing a digital city took more than just laying fibre in the ground. Other councillors agreed and the establishment of the office was endorsed, despite opposition from Crs Stevenson, Butcher and Lee Vandervis. 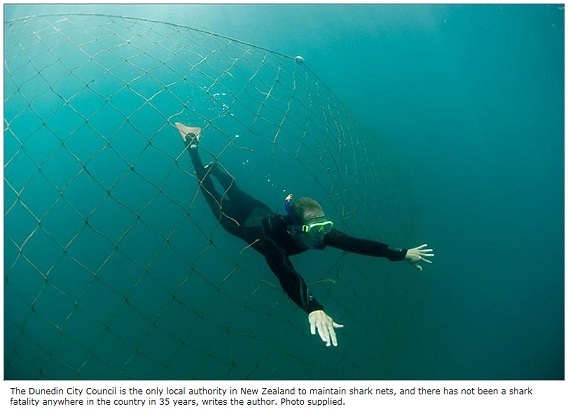 An attempt by Cr Lee Vandervis to signal the council would reconsider using shark nets off Dunedin beaches was deflected at yesterday’s Dunedin City Council community development committee meeting. Cr Vandervis was about to put forward a recommendation signalling the council’s intention to review the use of nets, which would save about $40,000 each year. However, committee chairman Cr Bill Acklin said the time to deliberate over the nets’ future would come during consideration of the 2011-12 draft annual plan. The draft plan containing funding for the nets for another year had already been released for consultation, Cr Acklin said. Instead, at Cr Paul Hudson’s suggestion, councillors voted for a resolution encouraging members of the public to make submissions on the nets. The manoeuvring came after Crs Kate Wilson, Richard Thomson and Lee Vandervis last month argued the nets were a waste of money and should be scrapped. The 100m-long nets were positioned off St Kilda, St Clair and Brighton Beaches each summer, after five attacks, three of them fatal, in the space of seven years in the 1960s and ’70s. Their move was defeated by a 6-7 vote at last month’s meeting, amid opposition from Crs Syd Brown and Neil Collins, who supported the nets’ use. Cr Thomson later asked for a report on the appropriateness of the nets, prepared by council parks and reserves team leader Martin Thompson, which was presented to yesterday’s meeting. The report said incomplete records dating back to 1977 showed 712 sharks had been caught in the nets, although there was no records of now-protected white pointers having been caught. Department of Conservation advice was nets were a way of fishing for sharks, rather than providing a barrier between sharks and swimmers, and catch numbers showed the nets were “not that effective” at fishing, the report said. Council community and recreation services manager Mick Reece told yesterday’s meeting three seven-gill sharks had been caught since Christmas, one 2.5m long that contained “most of a seal”. “They … are still killing sharks,” Mr Reece said. Earlier yesterday, two speakers at the council’s public forum detailed their opposition to the shark nets. Great White Southern Dive co-owner Peter Scott told the forum the nets gave swimmers a false sense of security, while New Zealand Marine Studies Centre senior aquarist Matthew Crane presented statistics that showed there had been just 44 unprovoked shark attacks in New Zealand since 1882, eight of them fatal. The speakers were also filmed as part of a thesis project by Nicole Schafer – a masters student at the University of Otago Centre for Science Communication – and fellow student Andrew Scott. Their project aimed to educate people about shark nets, and the film would be released at the science communication premiere in Dunedin in November. A fresh round of budget reviews is under way within the Dunedin City Council, as staff search for “hard-core operational savings” to ease the pressure on ratepayers. Council staff have been asked to put forward new savings initiatives during meetings with acting chief executive Athol Stephens this week. The initiatives would be considered by the council’s executive management team and councillors next week, along with the likely impact on council service levels, and could then be incorporated into the 2011-12 annual plan. The aim was to reduce the forecast 7.5% rates increase for 2011-12, while minimising the impact on the council’s service levels, Mr Stephens told the Otago Daily Times yesterday. Council staff were also considering the methodology of a series of wide-ranging departmental reviews requested by Cr Syd Brown – chairman of the council’s finance, strategy and development committee – during annual plan hearings earlier this year. The reviews would scrutinise the efficiency of various council operations, to deliver “substantial” savings in time for next year’s 2012-13 annual plan process, Cr Brown said. Staff had been “challenged” to identify new ways of saving money, but it was expected the wide-ranging reviews could also involve peer-reviews by consultants, and a budget of up to $200,000 could be required for the work, Cr Brown said. Some of the reviews could be completed “reasonably quickly”, but others would be more substantial and could take six to eight months. Cr Brown said in addition to maintaining capital spending “discipline”, operational savings would come “straight off the bottom line” and reduce the need for rates increases. He also wanted scrutiny of ways the council could increase its income base, not by increasing fees but perhaps by outsourcing council staff and services to the private sector where there was capacity to do so. However, he would not be drawn on whether the reviews would also consider reducing or capping staff numbers within the council – something his colleague, Cr Lee Vandervis, has called for. “It’s just a matter of doing things smarter and better and looking at FTEs [full-time equivalent staff numbers] and part-timers. “It’s just a matter of making sure you’re getting value for money in your investment in staff,” he said. He would not say what sort of saving or rates reduction coming from the reviews would be deemed a success. Mr Stephens said staff had not been given a target or goal for the latest round of budget reviews, after former chief executive Jim Harland pushed staff to find $6 million in savings late last year. That push eventually identified about $4 million in savings, helping reduced the 2011-12 forecast rates increase from 9.1% to 7.5% so far. Mr Stephens said while budget reviews were a normal occurrence within the council, this week’s meetings were the third round held since October last year – which was “not usually” the case. The key consideration when identifying savings would be the impact on service levels, with councillors saying they wanted “no more than minor” impacts, he said. The wider departmental reviews “may lead to” consideration of staffing levels, but hadn’t yet. “It depends on how far you go. If you go hard at it, and you say you’re not going to do a whole lot of things, then obviously you’d have to be thinking about staffing levels, and that would be incorporated into any kind of analysis. The Dunedin City Council is to consult the public on new road names around the Forsyth Barr Stadium – but not before suggesting a few of its own. Councillors at yesterday’s infrastructure services committee meeting considered a staff report outlining several possible names for new or realigned roads around the stadium. The report, by council land information team leader Rob Garrett, suggested naming the new section of State Highway 88 as part of the existing Ravensbourne Rd, while dividing the remaining sections of Parry St – either side of the stadium site – into Parry St “East” and “West”. Existing stretches of Union St and Ravensbourne Rd, near Logan Park, would be renamed as an extension of Anzac Ave, despite a questionmark over whether the change would dilute the name’s historic meaning, Mr Garrett said. A new road being built to access Magnet St and the nearby marina would be named Neptune St, after the World War 2 cruiser – lost with the lives of all but one crew member – which had Otago links. All suggestions aimed to stimulate public debate during consultation, with results then to be presented to the committee for consideration, Mr Garrett said. However, councillors were quick to express their views yesterday, and immediately moved to change Parry St East to Gambia St, after another of the World War 2-era cruisers, and Parry St West to a simpler Parry St.
Cr Kate Wilson also suggested the new section of SH88 be named “Carisbrook Rd” or “New Carisbrook Rd” to link the city’s old and new stadiums, but Cr John Bezett said public consultation should come before councillors’ “pet names”. That did not stop stadium critic Cr Lee Vandervis from suggesting Parry St be renamed Farry St, in an apparent swipe at Carisbrook Stadium Trust chairman Malcolm Farry. yet to be confirmed, but should begin within weeks, with results presented to the committee meeting on June 14. Affected property owners would also be contacted directly, ahead of wider public consultation, Mr Garrett said. It is delightfully backwards, with the sharks as connoisseurs and top predators instead of us, a minority group [the scuba fraternity] are victims, there is a touch of potty humour, and we are able to briefly laugh at our deep-seated fears – of sharks in particular, and being out of our depth in foreign environments in general. Our fear of sharks subsumes many deeper fears – the unknown of ocean depths, bloody dismemberment, other larger carnivores, racks of razor-sharp teeth, loss of family and friends, and sudden horrible death. University of Otago marine science department Associate Prof Mike Barker said the nets “do nothing except provide swimmers with an illusion of safety”. (ODT 1/1/2011). The nets only catch smallish shark species unlikely to cause human casualties, and these sharks get caught swimming away from the beach as often as swimming towards it. Ocean Zoo director Craig Thorburn, of Auckland, said none of the sharks caught in Dunedin’s nets over the past 35 years could be considered a danger to people. DCC staff have no record of a great white ever being caught in the nets. l idea that a few little nets across a long beach can do anything but snag a white pointer’s lunch, $38,000 of ratepayers’ hard-earned dollars is wasted every year. The need to be seen to be doing something, even if we know it is patently useless, is a reaction to life’s difficulties. Hopefully, with greater public awareness and better water safety education generally, we can stop this waste of net costs and debating time on council, and sink this silliness once and for all. – Lee Vandervis is a Dunedin city councillor. Forsyth Barr Stadium extras with a combined cost of $5.15 million have been approved by the Dunedin City Council. The funding has been described by Mayor Dave Cull as an “underwrite”. He said after two meetings yesterday that included discussion of the stadium some of the items agreed to were expected to result in revenue coming back to the facility. The project needed certainty now, though, and it was essential funding was agreed to, he said. The stadium took up most of two meetings and six hours of debate yesterday, and resulted in a list of six recommendations giving the go-ahead for funding to provide a catering fitout for the stadium, the relocation of a media suite from the south to the north stand, way-finding signs, relocatable toilets for the west stand and additional toilets on level three. Debate was heated, and early on, Cr Lee Vandervis was threatened with being asked to leave the meeting by chairman Cr Syd Brown. A report to the council from project delivery team chairman Stewart Barnett and Dunedin Venues Management Ltd chief executive David Davies said the items “are not exclusions from the overall project as managed by the Carisbrook Stadium Trust”. “There were strategies assumed for the funding of the original items which in some cases have not been provided for”. But Mr Cull had a different view. While much of the council meeting on the stadium extras was held with the public excluded, Mr Cull did as he said he would, and reopened the meeting to the public later in the day. He said then items had been dropped from the guaranteed maximum price contract so it would fit within budget. A report to yesterday’s finance, strategy and development committee meeting was titled “Forsyth Barr Stadium base building further requirements”. It said the catering fitout would cost $2.4 million. The report said the 2007 Horwath report on the stadium assumed the potential cost of the kitchen equipment and some fitout would be offset by an expected $2 million to $2.5 million from a caterer. The Carisbrook Stadium Trust (CST) was aware construction contingency money would be allocated to any deficit, but there was no contingency money left. The shift of the media suite was another large cost, at $1.3 million. The shift would see at least four smaller hospitality suites developed where it would have been in the south stand, and more revenue from sponsorship and advertising. The business case for the change was strong, the report said, with revenue of $2 million over 10 years expected. After the debate, Mr Davies said he was “humbled” by the support from the council, which had made “brave” decisions. He said the decisions meant when the stadium doors opened the facility would meet the expectations its users would have. At the end of the closed debate, six motions were approved. They included that the committee recommend the council approve additional capital expenditure of up to $5.15 million for the items, and that it approve borrowing of that sum only if required, noting additional revenue would contribute to debt servicing costs. The council and DVML would identify how much revenue could go to debt servicing, and the two organisations would explore all options to find funds from non-ratepayer sources. A further list of four items, including a fitout of level 2a, a wifi system for the stadium and a telephone exchange, all up costing $650,000, was noted, with DVML to provide a business case on the fitout. The Dunedin City Council has moved a step closer to resolving hundreds of illegal or informal water connections across Dunedin, but some homeowners could face back-dated bills for up to three years’ supply. The council’s water bylaw hearings subcommittee this week heard submissions on the draft bylaw, which will replace the older Water Bylaw 2008 next month. Changes would formalise existing informal and illegal connections, as well as establishing new rules to respond to further breaches of the bylaw. Among the changes the councillors agreed on was to increase the maximum period back-dated bills could cover from one year to three years. That followed comments by Dunedin Ratepayers and Householders Association chairman Lyndon Weggery at this week’s hearing. He argued it would be unfair to present some property owners with “informal” connections – some of them dating back more than a decade – with bills for only their last 12 months’ water supply. “It’s sending the wrong signal to the community,” he argued. Subcommittee member Cr Lee Vandervis responded by suggesting the limit on back-dated bills be increased from one year to a maximum of three years, with staff to decide after assessing each case individually. The move comes after Mayor Dave Cull – before being elected mayor – outed himself last year as a homeowner with an “illegal” water connection. He inherited the connection after buying his Otago Peninsula home 15 years ago and had not paid for water since, despite topping up water tanks on his property “from time to time”. Mr Cull notified council staff of the problem in 2008, but was told – like hundreds of other homeowners in the same position – it could only be resolved when the bylaw was updated. Council staff had since calculated 232 properties had illegal or informal connections, either receiving water without paying – inside or outside water supply zones – or receiving and paying for water while outside supply zones, a report by council business support leader Narelle Barbour said. Of the property owners, 39 had already been sent back-dated bills for 12 months’ supply, resulting in payments from 22 property owners, she said. Payments from another eight were waived for “genuine reasons”. Staff would assess each of the remaining connections once the bylaw was in place, her report said. The bylaw prompted 10 submissions, with three people choosing to speak at yesterday’s hearing. The subcommittee voted to approve the new bylaw, subject to final approval at the next council meeting on March 28. A public water main pumps right past Dunedin resident Mike Cowell’s front gate, but it might as well be a world away. Mr Cowell’s home in Coast Rd, near Karitane, is one of many rural properties within city limits to fall outside the Dunedin City Council’s water supply boundaries. In Mr Cowell’s case, that meant he relied instead on water collected from a nearby stream, harvested from the roof of his home or bought in bottles. Attempts to connect to the reticulated water main running past his front gate have been rebuffed by council staff since 2004. However, seven years on, he and other property owners have been given an indication changes could be afoot. Mr Cowell took his case to the council’s water bylaw hearings subcommittee, comprising chairman Cr Andrew Noone, deputy mayor Cr Chris Staynes and Cr Lee Vandervis, this week, as it sat to consider the new draft bylaw. The bylaw was aimed at clarifying how illegal or informal water connections discovered around the city, including at Mayor Dave Cull’s home on Otago Peninsula, would be resolved, and cases handled in future. However, Mr Cowell’s submission focused on the section of the bylaw prohibiting any new connection outside existing water boundaries. Mr Cowell said the extension of the council’s $9.4 million northern water scheme rural supply in recent years meant a pipe now ran right past his property, but “restrictive and inflexible” council boundary rules still denied him access to an essential service. He and his wife tried to conserve water. When regular tests showed the water he collected breached health guidelines, Mr Cowell’s wife resorted to bottled water for drinking and brushing teeth. His own preference was to simply ignore the test results, relying on his “reasonably strong gut”. Responding to his concerns, council water and waste services manager John Mackie said his “hands were tied” by existing rules, which acted as a planning tool preventing unwanted ribbon development along pipelines in rural areas. “That’s the big risk … to keep the nature and character of the rural zone. “It’s been used as a planning instrument,” he said. However, there were no technical reasons properties like Mr Cowell’s could not be connected, at a cost, once the implications for future demand were considered, he said. The council was “constantly” being approached by other residents wanting to connect, and Mr Mackie said he would be happy to provide greater access to supplies if other planning tools could be used instead. Staff had identified about 900 properties outside water zones but within 50m of a treated water main, “hundreds” of whom might want to connect “given the chance”, he told the Otago Daily Times later. In future, applications for out-of-zone connections could be referred to a council committee, rather than using a time-consuming special consultative procedure to deal with changes, as required now, he told the hearing. Crs Vandervis and Staynes expressed support for a move to loosen rules and allow greater access to council pipes. The committee asked Mr Mackie to prepare a report on the issue, to be presented to a future meeting of the council’s infrastructure services committee. Greater Dunedin councillors yesterday helped block a motion that would have ended more ratepayer money going to the Forsyth Barr Stadium, amid claims members of the group had broken election promises. It also became clear at a Dunedin City Council meeting that a catering fit-out was the essential item in a list tagged for additional funding at the stadium – a list that expanded during debate. Dunedin Venues Management Ltd (DVML) chief executive David Davies told the meeting the issue needed debate, and needed it quickly, if the stadium was to be ready in time for the Rugby World Cup. And Mayor Dave Cull responded to comments from Cr Fliss Butcher he was going back on election promises, saying he had never said he would make a blanket refusal on spending on the stadium. Rather, he said after the meeting, his pre-election position had been if spending was the difference between the facility opening or not, he would have to consider it. The council debated a report on “possible additional” spending at the stadium of $4.35 million. The report included a list of 11 items listed as “excluded” since 2008, including kitchen fit-outs, scoreboards and replay screens – items that have been widely reported in the past as requiring spending – and some new items, including signs and communication facilities. It emerged at the meeting the council had in late January voted that acting chief executive Athol Stephens undertake a peer review on a request for funding from DVML, and that DVML and the council apply for funding from non-ratepayer sources. At the urging of Cr Lee Vandervis, another item was included, moving the stadium’s media box from the south to the north stand, a decision made last year that would allow increased revenue. That made 12 items on the list. During debate, Cr Kate Wilson asked about turnstiles, which were not included at the stadium, and was told by Mr Davies the stadium could run efficiently without them. They were something he would prefer to have, but were an option that could be considered over the next five years. Public address systems would cost up to $40,000 to buy; hiring them would cut into profits. Mr Davies said for each item, DVML had a mitigation strategy, but hiring any equipment – from replay screens to toilets – cut into profits. The catering issue was another matter. Catering made the second greatest contribution to stadium revenue, and was the first thing people saw when they walked into the facility. For the kitchen fit-out, timing was important, and the “lead time” for manufacturers to provide the equipment was now tight. Mr Davies defended aspects of the original planning for the stadium when questioned by Cr Vandervis, and said the world was a different place than it was four years ago. In terms of renting space at the stadium – the fit-out of level 2A for rental was one item on the list – he said a landlord was in a stronger position than a tenant at that time, but that had “turned 180deg”. Signage, also included on the list, was not needed for matters like fire evacuation, as basic signage and seat numbering was planned for. But signs to “tell a story” of how to find seats, and where food and other services were, were not. Responding to a question from Cr Jinty MacTavish, Mr Stephens said “with a hearty shake” he could have the review ordered by the council ready in about a week. The meeting also ordered a final report from the rates funding working party, on its efforts to find money for the stadium, for a finance, strategy and development meeting on March 14. Mr Cull said after the meeting, as soon as those reports were in, the council would sit to make a decision. In the final part of the meeting, Cr Butcher moved that no more ratepayer money be spent on the stadium. But only she, Cr Vandervis and Cr Teresa Stevenson voted for that option. Crs Bill Acklin, John Bezett, Syd Brown, Neil Collins, Paul Hudson, Jinty MacTavish, Andrew Noone, Chris Staynes, Kate Wilson and Mr Cull voted against. Unusually thwarted by drizzle in the Ida Valley last week, I turned indoors to books. Alan Bennett’s marvellous autobiography Untold Stories quickly rose to the top of the pile and resisted all attempts by the others to displace it. Bennett is such a spectacularly good writer, I am surprised the bulk of the world’s wordsmiths don’t abandon the craft upon reading him and take up more humbling professions, like puttying windows. Bennett chose to make his autobiography a little differently, inspired by the annuals he enjoyed as a child. Hence his weighty memoir gives you a bit of this and a bit of that, chronology abandoned in favour of an expressionist swirl of events, people and essays which, at the very end of 650 pages, does actually form a perfect autobiography. There were no windows to putty in the Ida Valley, so for respite from this towering excellence, I sifted through our library in the lounge, three shelves of tombola stall miscellanea, accrued largely from the annual Alexandra used-book sale and second-hand stores. There is a kind of book we have defined over the years as an Ida Valley book, one bought for or donated to the library because it fits. Hence the bulk of them are ridiculously quaint, although just in case visitors think we are no more cultured than the mountain men from Deliverance, there are six Margaret Drabbles and a Ngaio Marsh. But here too are palpably useless reference books, a Moore’s Almanac with astrological predictions for 1979, and three South Island Automobile Association Accommodation Guides, none more recent than 1977-78. Combing further through the fading dusty spines. I found The 1984 New Zealand Party Manifesto, (candidate #10, Lee Vandervis, from Dunedin); Celibacy: Success or Failure, translated from the French by Una Morrissy; and Old Jack, A Tale For Young Boys, by W.H.G. Kingston, 433 pages, no date, one shilling and sixpence. “Old Jack gave me his history,” writes Kingston. Tawdry paperbacks depicting the Wild West are in every rural niche library, including ours. Louis L’Amour, the master, has Chancy, (“Fate dealt Otis Chancy four of a kind – all bullets”), while Emerson Dodge serves up The Devil’s Deacon, (“A Bible in one hand, a six-gun in the other”). Why aren’t more boys called Otis? And among our many ageing magazines, the utterly astonishing Victory, a huge and heavily-pictorial 80-page propaganda weapon put out by the American War Office during World War 2, pictures of German prisoners surrendering to US troops, “when they realised further resistance was useless”, and laudatory features on square-jawed military personnel, (“Admiral William F. Halsey : Aggressive, Daring, Persistent”). Fittingly, our library contains two of those Christmas Tree annuals that Alan Bennett enjoyed so much, books that started him off on his magnificent way. Noel Streatfield’s 1959 Ballet Annual has many stories for pirouetting young gals, only one of them in comic strip form (Too Tall For Ballet, which has a heart-wrenchingly humane ending). Plus the usual photos of bedroom wall stars, Moira Shearer, on her wedding day no less, and Beryl Gray, whose caption endearingly asks the reader to notice her fine forehead, her wide-apart eyes and generous mouth. And finally for tough young lads, there is Tales Of The Royal Canadian Mounted Police, bracing accounts of fear, adventure, danger and rescue, where spiffing uniforms constantly prevail over unshaven evil. More comic strips in this one because, of course, boys are much thicker than girls at this age. I particularly enjoyed The Bear Truth (“Slowly, very slowly, that shaggy monster began to squeeze the life out of Corporal Gagnier”). Roy Colbert is a Dunedin writer. For Dunedin Mayor Dave Cull, the stunning but underused heritage buildings between Cumberland and Crawford Sts do not have to be used as commercial buildings, or apartments. His idea is, in 10, 20 or even 30 years, a retirement complex of the sort now dotted around Mosgiel, but in a location and in buildings perhaps more conducive to the baby boomers who will soon be shuffling towards their twilight years. That idea, though, would require some serious changes to planning rules for the city, rules that have attracted some criticism. To the council’s credit, those concerns are not new to elected members or staff, mainly because of the work of the heritage buildings economic reuse steering committee. The committee was voted into existence in January last year, its purpose to find what barriers stood in the way of the city’s heritage buildings being saved and reused. The brainchild of the last council, it grew from a heritage strategy developed in 2007, the appointment of a heritage policy planner in 2009, and was one of the first committees chaired by then councillor Dave Cull, now Dunedin’s mayor. With Mr Cull’s duties now expanded because of his mayoral role, the chairmanship of the committee has been taken over by Cr Lee Vandervis, while the staff member doing much of the work is heritage policy planner Glen Hazelton. Mr Hazelton said after a year, the committee had completed the information-gathering phase and identified the problems, and it was now in the “opportunity phase”. When discussing some of the challenges the city faced in saving its heritage, Mr Hazelton pointed to an underlying issue mentioned by many of those spoken to. “We simply have more buildings than there is demand for the space. “That is one of the primary challenges. There was a boom in the gold-rush days, and those buildings are still standing. “Because of low economic growth, they are still there. Mr Cull said the steering committee was set up for two purposes, the first to identify any impediments to reuse of buildings, the second to find ways to overcome those impediments. To identify them, it had met with a variety of groups, including engineers, real-estate agents, property managers, valuers, tenants, owners and insurance brokers, and had visited a variety of sites to see what their issues were. It was now at the stage of trying to formulate some solutions, at least in areas over which the council had some control. Mr Hazelton listed the main challenges that had been identified. He said heritage buildings had inherent issues: they were built a certain way, which often did not meet the purpose people had for them today. If they were not maintained, there was a cost to reusing them; there were more buildings than there was demand for them; and not everyone who owned buildings had a passion for heritage. There were also leadership issues concerning how the council and others involved in heritage dealt with the issues, and, finally, there were regulatory challenges; Building Act, resource consent, district plan, and earthquake-prone policies. “Sometimes there are barriers there. We’re looking at ways we can co-ordinate things better so there’s a consistent message,” Mr Hazelton said. “We have the raw resources, many of the best experts in the country in things like earthquake strengthening; how do we capitalise on that so we have courses at the university, pilot schemes that match all those things up? In addition to those problems, Mr Cull noted the perception of the expense of earthquake-proofing buildings, and dealing with fire prevention. Another major problem was that a good deal of Dunedin’s heritage building was on leasehold land. “For a variety of reasons, there is no incentive for someone who owns the building, but does not own the land, to put money into the building. Asked when the committee would start looking at solutions, Mr Cull said it already had. The Canterbury earthquake in September had “really brought the dangers home to us”, and the committee was looking at producing a checklist on how to look after the most vulnerable parts of old buildings: the chimneys and the parapets. Cr Vandervis said while the council may only ever be in a “seed funding” role, it would be possible to use heritage funding to hire engineers to devise generic solutions to reinforce chimneys, or perhaps tie back a facade. “The surprising thing to me was in the case of a chimney all you need to do is put a stainless-steel pipe down it, and although it may not save the chimney in the case of an earthquake, it may at least keep it up there, stop it coming through the slate roof, the next floor and so on. Mr Hazelton had also developed a “team approach” at the council, where staff from different departments guided a person through the process. “There is the possibility to line them up with incentives, the heritage fund, or if it’s a big project it might qualify for rates relief,” he said. “Last year, we had the `getting started’ workshop for building owners. We want to make that an annual event. For what he described as the opportunity phase, the committee would begin “brainstorming solutions”, working out ideas that could be implemented without a change of policy or a “massive” amount of funding. Reviews of the district plan and the dangerous, insanitary and earthquake-prone buildings policy were also under way. Rates relief for reuse of heritage buildings (contestable fund; up to 50% off general rate for approved projects). Heritage reuse award ($1500 to winning owner). Heritage reuse design competition for tertiary students ($3000; sponsored by DCC, Wall Street mall, Octa and New Zealand Historic Places Trust). – The Dunedin City Council heritage buildings economic reuse steering committee is chaired by Cr Lee Vandervis; Cr Fliss Butcher is the other elected member. Council staff members include heritage policy planner Glen Hazelton, and representatives of the building control, property, and economic development departments. The other members are New Zealand Historic Places Trust Otago-Southland area manager Owen Graham, and building owner representatives Ted Daniels, Jeff Dickie, and David Booth. – The heritage strategy was adopted by the Dunedin City Council in August 2007. It is a non-statutory document that formally recognises the importance of heritage to Dunedin, its residents and visitors. The strategy sets out the vision and goals for the sustainable management of Dunedin’s heritage. It also provides the framework to guide the council’s future work programmes and initiatives for heritage across the entire district, which will involve working with property owners and other organisations concerned with heritage management. The Otago Polytechnic’s Community Learning Centre will move to the Mosgiel library next month, ending a debate about the best home for the facility. The decision has disappointed Mosgiel Taieri Community Board chairman Bill Feather, who said last night the council did not take full account of the board’s concerns. He was also “a little bit incensed” that, despite being at yesterday’s council meeting when the decision was made, he was not invited to speak. The proposal to relocate the learning centre to the town’s library was raised by polytechnic chief executive Phil Ker last year, and presented to the community board earlier this year. The polytechnic had operated a learning centre in Mosgiel since 2004, offering introductory computer courses and National Certificate programmes, but government cuts to community education funding had put the city’s three centres under threat. But community board members were not keen on using the foyer of the Downes Room at the library, instead voting on February 1 for “option two”, a $20,000 plan involving decommissioning male toilets and enlarging that area to house the centre. During discussion on a report to a full council meeting yesterday, Cr Lee Vandervis argued ratepayers’ money should not be used for “government departments that have had their budgets slashed”. But Cr Bill Acklin moved the centre be allowed to use the foyer for 12 months, described as `a trial period”, and deputy mayor Chris Staynes summed up the argument for that outcome. Cr Staynes said 274 people had used the centre in the past year, including the many elderly people in Mosgiel who required help with their computer skills. He accepted there might be some inconvenience for other users with the centre in the foyer, but in the long term, it would not be serious. Mayor Dave Cull agreed, saying that in the context of the city’s digital strategy, partnerships with government organisations were the sort of “lateral thinking” the council needed to use. After the meeting, council library services manager Bernie Hawke said the option approved would cost little and require little work, such as adding power points and installing cabling. Polytechnic business and sport group manager Chris Morland said he expected the centre to be ready to open by late March. A proposal to relocate the Mosgiel Community Learning Centre to the town’s library has caused divisions between some Dunedin city councillors. The idea would have the Otago Polytechnic’s learning centre relocated to the foyer of the Downes Room, inside the Mosgiel library, free of charge. It was first raised by polytechnic chief executive Phil Ker last year, and presented to the Mosgiel Taieri Community Board earlier this month. This week it was the turn of the Dunedin City Council’s community development committee to discuss the proposal, prompting disagreement between some councillors about the merits of the shift. Cr Syd Brown was among those to support the move, saying the centre’s service was “really treasured” in Mosgiel and would be a good fit inside the library. However, Cr Fliss Butcher suggested the centre’s courses could serve to recruit students for the polytechnic’s main campus and, if that was the case, wondered why ratepayers should be supporting the polytechnic’s marketing. Deputy mayor Chris Staynes – the council’s representative on the polytechnic’s council – disagreed, saying the courses were run at a cost and “very few” students went on to take fee-paying courses at the main campus. “Some do, but it’s not operated as a marketing exercise for the polytechnic,” he said. The centre was one of three operated by the polytechnic offering free and introductory courses, but was under pressure from Government cuts to community education funding, chief executive Phil Ker said last month. A report by council library services manager Bernie Hawke to this week’s meeting, recommended using the Downes Room foyer over four other options, including refurbishing a male staff toilet to create space for the centre. The foyer space was under-utilised, and the centre would have “synergies” with the library and the council’s digital strategy, while ensuring the community continued to benefit from the courses offered, he said. However, Cr Lee Vandervis worried a precedent might be set and also wondered why ratepayers should subsidise the polytechnic. Mr Hawke said a failure to support the centre would likely see it close, leaving just two centres in central Dunedin and forcing Mosgiel residents to travel to study. “They would basically just retract the service,” he said. Cr Staynes said he did not believe the support amounted to a subsidy, but would allow the service to continue in Mosgiel. “If we don’t wish to do that then the polytechnic will make other plans,” he said. However, Mosgiel Taieri Community Board chairman, Bill Feather, also took issue with the move to the foyer space, telling the meeting the Downes Room foyer was needed for Civil Defence purposes and other events. He said the board favoured refurbishing the staff toilet – at an estimated cost of $20,000 – to make room for the learning centre instead. Following the debate, councillors voted to ask the council’s city property department to consider refurbishing the toilet area for use by the polytechnic, with a report on funding sources to be presented to the council on February 21. Plans for a second pedestrian link connecting Dunedin’s harbourside and inner city will be presented for public consultation, despite doubts voiced yesterday. Councillors at yesterday’s Dunedin City Council infrastructure services committee voted to include the $96,000 footpath project – running up the Jetty St overbridge on-ramp from Cumberland St – in the 2011-12 draft annual plan for consultation. That was despite opposition from some councillors at yesterday’s meeting, who questioned the need for the new footpath, given plans unveiled last week for a larger pedestrian and cycle bridge to the harbourside. The planned pedestrian and cycle bridge could cost up to $3.5 million if built, and be open by 2016. Cr Richard Thomson said he would support including the project in 2011-12 draft annual plan consultation, but was “struggling” to understand why the footpath was also needed, given plans for the larger bridge. A council staff report said the footpath would link to a footpath already on the overbridge, which crosses the railway line to the harbourside area. The additional footpath was needed for safety reasons, as pedestrians were already walking up and down the on-ramp, staff said. However, Cr Thomson said commuters had gone without the pedestrian link for 30 years, and wondered if it was “too much to ask” for them to wait for the larger bridge to be completed, rather than building both structures. The new footpath would be just 50m to 60m from the larger bridge, if built, but the bigger bridge would be closer to the majority of people using either link. “It [the Jetty St footpath] would be perfectly fine if it’s done, but I just can’t see the need for it, when you put it into a longer-term perspective,” he said. Other councillors also opposed the footpath, Cr Chris Staynes saying it was be a “nice option” that could not be justified, and Cr John Bezett worried it could be used as a reason not to build the larger bridge. “Until that’s done, I don’t think we should be looking at any another access,” he said. Cr Jinty MacTavish took a different view, suggesting plans for the larger bridge should be scrapped in favour of an expanded Jetty St project that also catered for cyclists, saving money overall. Others supported the project. Cr Colin Weatherall said it would enhance road safety, while Cr Lee Vandervis – initially dubious about its merits – said he could “actually see some value” in another link. “Whether or not we get a bridge … this link will be used to go to other parts of the harbour now and in the future,” he said. Plans to rejig council budgets to cover a $278,000 shortfall in funding from the New Zealand Transport Agency for the latest stage of the Otago Peninsula cycleway were officially abandoned yesterday. The move came after NZTA staff on Friday reversed an earlier decision not to pay its full subsidy towards the next $1 million stage of the cycleway, from Vauxhall to Doon St on Portobello Rd. Council transportation operations programme engineer Michael Harrison told the meeting the NZTA decision meant the Vauxhall stage would proceed as planned, without the rejig. However, the order of the remaining 11 stages of the project would still need to be reconsidered. A report discussing future funding and timing issues would be presented to a subsequent committee meeting, he said. Dunedin ratepayers are facing a 6.5% draft rates increase for the year: now it is up to the public to tell its council whether or not that rise is acceptable. A sometimes testy almost seven-hour debate ended the city council’s draft annual plan meetings for the year, with the result now set to go out for public consultation, with three days of public hearings set down for May 4. Although staff had already spent months cutting a forecast 9.1% down to 6.1% by the start of the meetings late last month, the council has again sent them away to find further savings before the annual plan’s adoption in June. The meeting also decided to re-jig rent rises for council tenants, with a $10 a week across the board increase changed to $12 a week for newer flats, and $9 a week for older ones. The meeting, which was adjourned last Monday, reconvened with a rates rise of about 6.4%, after various increases, including the cost of the John Wilson Ocean Dr reopening at nearly $500,000, were included in the budget. Stephens to identify further budget reductions in the 2011-12 draft annual plan. A requirement for increased staffing levels was be reviewed by Mr Stephens to reduce the percentage increase in budgeted staff costs, and further operational savings were to be identified. The savings were to be reported back to finance, strategy and development meetings by June 27. Mr Stephens said it was the first time he had seen the recommendations. He noted additional costs had already been included in the draft plan by councillors, and he was concerned staff were being asked for reductions that were difficult to make. Cr Staynes said after the meeting any changes could not affect service levels in a way that was “more than minor”, as the draft plan had already gone out for consultation. He said cost reductions should be a “continuous project” at the council. Mayor Dave Cull said some proposals to reduce rates, such as a reduction in library hours and cutting the council’s electricity fund for people who could not pay their electricity bills, were unacceptable to councillors. As well, the council had brought forward work on climate change, which showed it was taking that issue seriously. “The way I see it, this is just further refinement to reviews that have already been set up before this meeting,” he told the council. The recommendations were passed by all councillors, except Cr Lee Vandervis. Mr Vandervis said the council’s failure to “slash and burn” was the reason it had such high debt. Personality clashes and allegations of “libellous emails”, sparked by the latest report on the Forsyth Barr Stadium, marked a Dunedin City Council committee meeting yesterday. The report, from the Carisbrook Stadium Trust (CST) and the project delivery team, led to a variety of discussions about the controversial project. The report, which is given to each finance, strategy and development committee meeting, was presented by CST chairman Malcolm Farry, Dunedin Venues Management Ltd (DVML) chief executive David Daviesand DVML commercial manager Guy Hedderwick. Cr Lee Vandervis asked Mr Farry about a $1 million donation he said Mr Farry had spoken of in the past. Mr Farry responded he had “seen some of your libellous emails”. When the meeting calmed down, he said the answer depended on the definition of a donation. He knew of two parties who had given $1 million each, but did not consider those donations. Others had bought suites at the stadium and considered paying for them was a donation. The private-sector funding figure approaching $40 million was “absolutely astonishing” he said. Both Mr Farry and Mr Davies said the project was on time for the Rugby World Cup later this year. Mr Davies was asked by Cr Colin Weatherall about the catering and kitchen contract, after recent news there had been differences of opinion over space for the provision of those facilities. Mr Davies said a “meeting of minds” would occur in Auckland soon to discuss the matter, and he hoped to have a contract signed with a preferred candidate by the end of this month. Cr Vandervis asked if people who had bought suites and other ticketing packages would automatically be able to attend concerts such as the planned Elton John concert later this year. Mr Davies told him those people had entry to see the Highlanders and other local rugby, but had to pay for concerts. They had first option on tickets for such concerts, but if they did not use them, they would be approached to arrange the suite to be on-sold to others for the event. It would be easier to list the countries which Dunedin’s newest New Zealand citizens did not come from, Dunedin Mayor Dave Cull joked at a citizenship ceremony in the Glenroy Auditorium yesterday. Thirty-five new citizens, from countries including Nigeria, Britain, Canada, the United States, Malaysia, South Africa, Ethiopia, Germany, Korea, Taiwan and Pakistan, were sworn in at the ceremony. Mr Cull said the presentation was a “special and significant ceremony”. “While our Maori heritage goes back over 1000 years, New Zealand is still a young country with a diverse mixture of cultures and people,” he said. Among the new citizens was Dunedin City councillor Lee Vandervis’ wife, Antonie, who was born in Murnau am Staffelsee, Germany. Dunedin mayoral candidate Olivier Lequeux’s son Maxim, whose nationality was given as French American, also took an oath of allegiance. 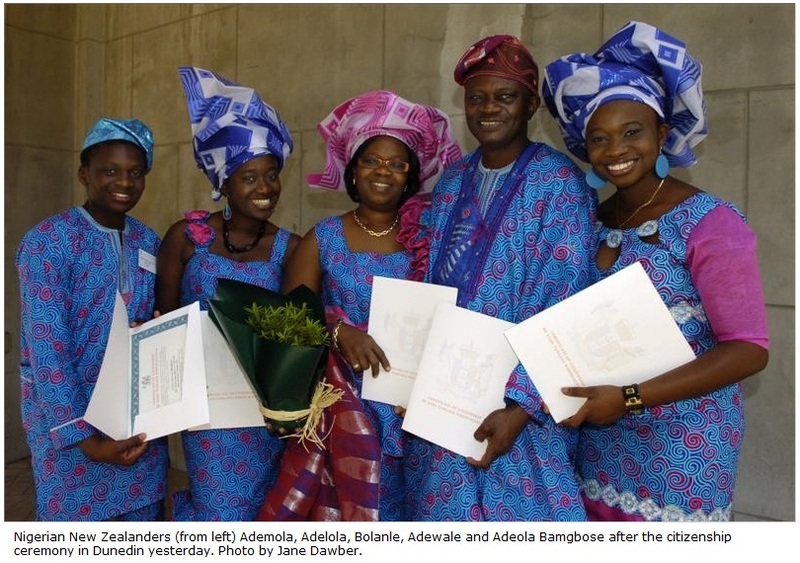 Also very happy to gain citizenship was the family of Dunedin Hospital nurse Adewale Bamgbose, who emigrated to Dunedin in 2004 from Lagos. The ceremony was an important ritual for him, his wife and three children, Mr Bamgbose said. An attempt to reel in Dunedin’s shark nets appears dead in the water, despite claims they offer nothing more than a placebo effect. During Monday’s 2011-12 pre-draft annual plan hearing, Cr Kate Wilson argued the council’s shark net contract should be cancelled as soon as possible, saving up to $40,000 each year. Her suggestion won support from some councillors, including Richard Thomson, who said the nets created “the most enormous placebo affect you could possibly create in water”. However, Cr Syd Brown opposed the move, saying a first cousin of his, and “the guy who sat next to me at school”, had both been “taken” by sharks over the years. Cr Neil Collins also supported the nets, saying – like the shark bell at St Clair – they gave reassurance to people, and nobody had been lost to a shark in Dunedin since the nets were installed. The sets of 100m-long nets were positioned off St Kilda, St Clair and Brighton beaches each summer in the years following five attacks – three of them fatal – in the space of seven years in the 1960s and 1970s. About 700 sharks have been killed in the nets since council records began in 1977. However, Cr Paul Hudson said councillors could have “no idea” how many sharks had been deterred from swimming into the city’s beaches by the nets, without being caught. Cr Lee Vandervis countered, arguing nobody could know how many sharks were attracted to the beaches by the rotting bodies of other sharks caught in the nets. Cr Wilson’s recommendation was lost 6-7. That meant the budget for the nets would remain in the council’s draft annual plan when released for public consultation. 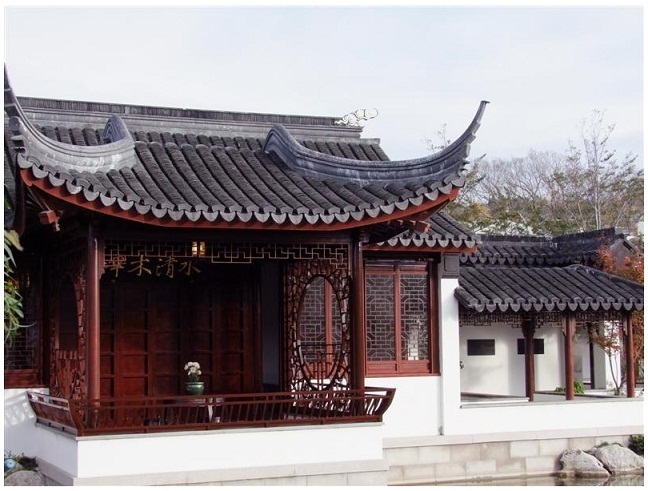 Dunedin’s Chinese Garden could be closed on quiet days, or leased to a private operator, amid fears the Dunedin City Council is “flogging a dead dragon”. The options – together with a possible merger of the garden with the neighbouring Otago Settlers Museum – were raised as councillors continued deliberations on the 2011-12 pre-draft annual plan yesterday. Councillors were last night due to have the size of the rates increase for the draft plan calculated. But after debate continued into the night, this was delayed until a meeting next Monday. A report on the Chinese Garden by council community life general manager Graeme Hall to yesterday’s meeting showed revenue from admissions and shop sales at the garden had dropped from $516,717 in the first year of operation, beginning in mid-2008, to just $250,880 in 2009-10. With operating costs of $956,000, and revenue forecasts for 2011-12 revised down to $380,000 for the year, that meant rates funding of $576,000 was needed to run it in 2011-12, councillors were told. That was on top of $1 million the council had already contributed towards the $14 million cost of developing the garden, as well as the cost of council land to house the garden, councillors were told. Operating costs – including a staff of two and regular maintenance and repairs – were largely fixed, but work was under way to develop revenue streams including cruise-ship tourists, garden manager Margo Winchester told the meeting. She was also working to develop “synergies” with other tourist attractions in the city, but was facing stiff competition in trying to crack the cruise-ship market. However, Cr Lee Vandervis argued the garden’s potential appeared to have been “massively oversold”, and the council needed to cut its losses. He questioned where the garden’s future lay, given it appeared Dunedin residents were not returning for repeat visits, and hopes of strong interest from Chinese tourists appeared not to have eventuated. Mr Hall said he did not believe so, but conceded the aim of reducing the council’s share of operating costs by half, to bring it in line with Olveston, was “not yet” possible. The dire picture prompted Cr Richard Thomson to suggest leasing – but not selling – the garden to a private operator to run, even if the lease did not provide a return to the council. “[It would] still be half a million dollars less cost to the ratepayers than it currently is,” he said. Mr Hall said that had not been considered but could “certainly be one of the options”. Cr Thomson said the garden should be given another year to try to turn its financial fortunes around, and consideration given to a private operator if it could not. He also questioned whether even the reduced income expectations of $380,000 for 2011-12 were realistic, given income in the last financial year was just $250,000. “It’s still 50% more than what was achieved last year,” he said. Ms Winchester said better days were expected, with indications the global recession – and its impact on tourists’ spending – had reached bottom. “We are all optimistically thinking that hopefully we have hit the bottom of the recession,” she said. Deputy mayor Chris Staynes also asked for a staff report considering whether the garden could be closed on quiet Mondays and Tuesdays, when cruise ships were not scheduled to visit Dunedin, to reduce operating costs. That won support from Cr Vandervis, who said the closures should be considered “and perhaps even more beyond that”. Councillors voted to seek a staff report discussing savings that could be achieved by incorporating the garden into the Otago Settlers Museum’s operation, and the likely capital costs of doing so. They also asked for a report on other ways of achieving savings. Work on an $8.6 million entrance to the Otago Settlers Museum is to proceed, after Mayor Dave Cull warned a delay could put the museum’s future in jeopardy. His comments came during yesterday’s 2011-12 pre-draft annual plan hearing deliberations as attention turned to whether to proceed with the fourth stage of the museum’s upgrade. Councillors were considering a report outlining the impact of delaying the project, after Cr Syd Brown suggested some capital projects would have to be deferred to save money. The $8.6 million stage four involved construction of a new museum entrance, foyer and shop and housing for the steam locomotive Josephine. The report by council community life general manager Graeme Hall said a 12-month delay to stage four would reduce rates funding required by $141,000, which was the saving on interest payments for the $8.6 million during the 2011-12 year. However, delays could also bring additional costs, including inflation, reduced revenue and the continued storage of Josephine off site, and put external funding at risk, he said. Overall, consultants believed savings could not be achieved, and a delay could in fact increase overall costs. Mr Cull was among those to throw his support behind the project yesterday, saying there would be “a major risk” to external funding for the project, and the museum’s future, if it was not completed. A letter from the Government confirmed its funding of $1.5 million would have to be reconsidered if the scope of the project changed, he said. “I think the attraction would be at risk. “I think the viability of the whole museum would be put at risk were it not to be completed. “It needs an entrance,” he said. Earlier yesterday, museum director Linda Wigley defended the project in the face of questioning from some councillors, saying the entrance would include space for a shop and functions, as well as leading visitors to the starting point of chronological exhibitions. Without the entrance, the customer experience would suffer, she said. “We won’t have a reception or a fully functioning entrance to the museum. “It would affect the proposed visitor flow through the museum … it would be coming in part-way through the story,” she said. Cr Lee Vandervis led the attack on the entrance, describing it as a “great triangular glass box folly” and asking why the museum could not survive without a smaller, simpler entrance. “We don’t have $8 million to build this triangular box. “It’s going to have to be borrowed when we have got no headroom left,” he said. Cr Brown said the decision was one for councillors, and he supported the museum project’s first three stages, which upgraded storage and exhibition spaces. However, the entrance planned as stage four was an optional extra that, while “nice”, could afford to be deferred, he believed. He was “a little disappointed” the staff report considered delaying the project by only 12 months, rather than several years, and believed consultants’ advice that savings could not be achieved was based on a “vested interest”. However, other councillors opposed any cuts, with Cr John Bezett saying the council was in danger of making the same procedural mistake he believed it made when it axed plans for the realignment of Lovelock Ave. The museum project had been under way for years, a staff report had clearly identified the disadvantages of scrapping the project, and very few councillors fully understood the implications of doing so, he believed. “The process, I think, is so wrong,” he said. Cr Bill Acklin said the impact of delaying the project was not worth the effort, and urged councillors to complete the project “and do it properly”, while Cr Fliss Butcher argued the result would be a museum that would be the envy of New Zealand, and possibly Australia. Cr Richard Thomson said savings would be offset by new costs created as a result, and any delay would be “shortsighted”, and deputy mayor Chris Staynes said the report’s conclusions meant a delay “really isn’t that attractive”. Councillors voted 10-5 to proceed with the fourth stage of the upgrade, subject to public consultation on the 2011-12 annual plan. Opening hours at the Dunedin City Library seem set to survive the Dunedin City Council’s scalpel, following a public outcry against a proposal to close the doors earlier on weekday evenings. However, plans for the new Blueskin Bay library have not fared so well, with councillors moving to defer the $860,000 project – of which the council was to pay $500,000 – until 2012-13. Councillors have also approved revised capital spending plans for the city’s libraries, subject to approval, which would see $4 million spent refurbishing the central city library and another $10 million on the long-awaited South Dunedin library. However, the development of the South Dunedin branch could yet be further streamlined, with council staff exploring the possibility of public-private partnerships for the library and other projects, council city property manager Robert Clark told councillors. The developments came as councillors yesterday resumed deliberations on the 2011-12 pre-draft annual plan. The proposal to reduce the library’s opening hours on weekday evenings was quickly defeated, with Cr Bill Acklin recommending the hours remain unchanged following a public backlash against the idea. “In my whole time being on council, I have never received so many letters than I have about this,” he said. The move would have seen the library closing at 6pm most weekdays, except Thursdays, saving $33,500 in 2011-12 and $50,000 annually after that. Those opposed to the move worried it would rob some city workers and others of access to the library, with Dunedin Public Libraries Association president Merle van de Klundert describing the idea as “wicked”. A report by council library services manager Bernie Hawke warned the reduced hours would inconvenience 712 people per week, or 35,600 people each year. Cr Syd Brown, chairman of the council’s finance, strategy and development committee, argued the council needed to make unpopular decisions if it was to make savings, or risk “bowing to the interests of interest groups”. However, other councillors argued against the proposal, with Cr Lee Vandervis describing the proposal as “a cut in the wrong area”, while Cr Richard Thomson said significant savings had already been found from within the council’s libraries capital spending programme. 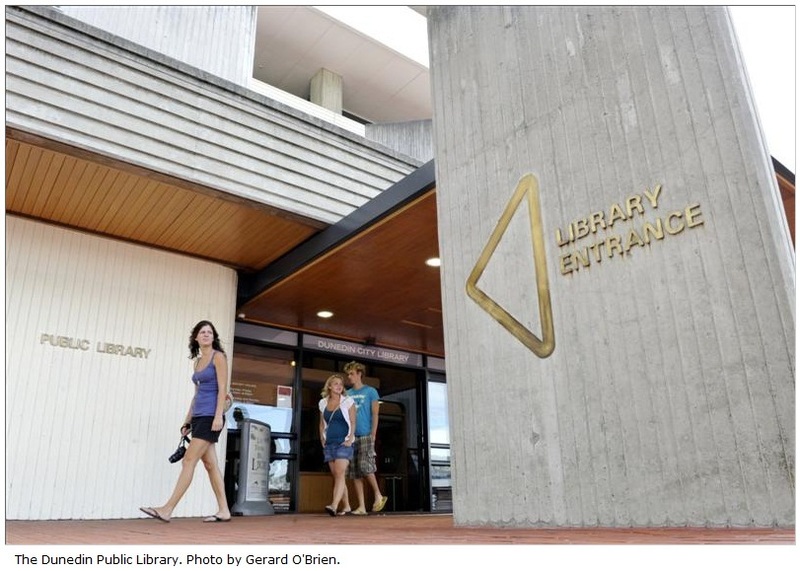 “The degree of disruption to the public’s ability to use the library is simply too large for the savings that are envisaged,” Cr Thomson said. Cr Teresa Stevenson said the “very healthy habit” of working parents taking their children to the library in the evening should be encouraged, while Cr Andrew Noone said public demand for evening opening was evident. Cr Kate Wilson supported investigating a targeted rate for libraries funding, which won support from Cr Paul Hudson, who argued some ratepayers paid thousands of dollars for libraries through their rates but never used them, because they lived too far away. He asked staff to report back on the possible use of targeted rates to fund libraries. Councillors voted to keep central city library hours unchanged, and asked the council’s rates funding working party to review the use of targeted rates for libraries and potentially other council services. Any changes would be included in next year’s long-term council community plan deliberations. Councillors also voted to defer the Blueskin Bay library project until 2012-13, after hearing fundraising for the $360,000 community share of the project was yet to start. The proposal to scrap the central city library redevelopment, helping reduce libraries capital spending to 2014-15 from $29.6 million to $14.5 million, would still allow for an adequate refurbishment of the “tired” central library, Mr Clark told councillors. That could include creating more cafe and retail areas around the library, boosting revenue, he said. Refurbishing the central city library – including installing new technology – would also free up staff to transfer to the South Dunedin library, allowing both libraries to be run from existing budgets, council community life general manager Graeme Hall said. Evening opening hours at Dunedin Central Library unchanged. Blueskin Bay library project deferred to 2012-13. Plan to refurbish Dunedin Central Library and build South Dunedin library approved. Council staff investigating public-private partnerships for South Dunedin library and other projects. All decisions subject to final approval following public consultation and public hearing May 4-6. 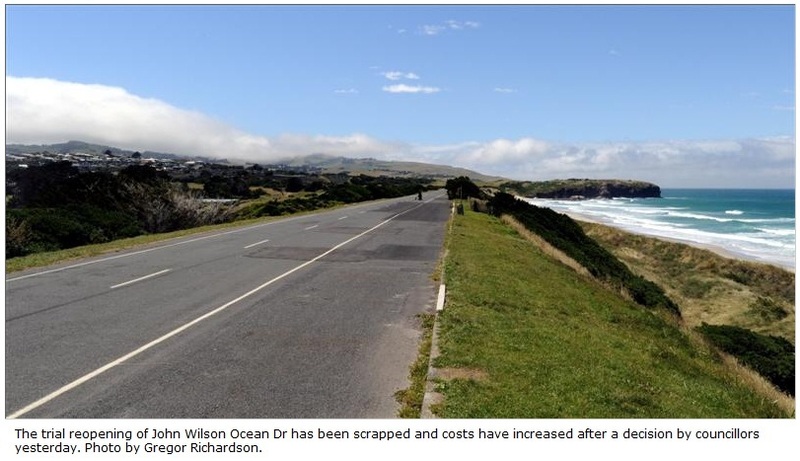 The long-running saga over the future of Dunedin’s John Wilson Ocean Dr has taken another twist, with the cost of reopening the road likely to double to nearly $500,000. It is also likely the seaside road will remain closed to motorists for longer than had been signalled, and vehicle access could be more restricted. The changes come after Cr Fliss Butcher – on behalf of the hearings committee that heard public submissions on the road last year – tabled a revised list of recommendations at yesterday’s 2011-12 pre-draft annual plan hearing. Councillors had been expected to vote on “Option B” for the road’s redevelopment, which would have the road developed into a shared space for motorists, pedestrians, cyclists and others at a cost of $220,519. In the meantime, the road was to be reopened to motorists as a trial as early as today, initially from 7.30am to 7.30pm daily until March 31, and then from 8am to 5.30pm daily until June 30, until consultation as part of the annual plan process was complete. Instead, Cr Fliss Butcher’s changes recommended the more expensive “Option C” for the road’s redevelopment, costing $487,519. The extra cost included $107,000 for a new mechanical arm to control vehicle access to the road, as well as other additional improvements, councillors were told. The change also scrapped the proposed trial, with the road to remain closed until it was safe to reopen, and reduced the hours it would eventually be open to motorists to 10am to 3pm daily. Cr Butcher said the changes were in keeping with the intention of the hearings committee’s recommendations, which she believed offered the best solution, and urged councillors not to rehash the debate. Worries about the extra cost could be addressed by staging the work, she said, although no details were given. “We know it’s got a cost attached to it, but we are going with it,” she said. The change won support from Cr Richard Thomson, who said it “struck the right balance”, and Cr Bill Acklin – a member of the hearings panel – who believed it would allow the council to “do the job properly”. Cr Jinty MacTavish said it was an “admirable compromise”, but could not support the “unacceptably high” cost. Cr Teresa Stevenson said the spending was a “waste” and the money would be better spent on more city cycleways, while Cr Lee Vandervis wondered why nearly $500,000 was needed to reopen a road motorists had enjoyed free access to for many years. Councillors voted 11-3 in favour of the revised plan, which would be subject to further public consultation through the annual plan process. There were emotional scenes as Dunedin city councillors agreed to accelerate the pace of a three-year climate change planning project yesterday. Cr Jinty MacTavish, speaking at yesterday’s 2011-12 pre-draft annual plan hearing, burst into tears as she argued passionately for her recommendation to condense the project into two years. A staff report to councillors had recommended completing the work over three years, as planned, at a cost of $67,000 each year, plus additional costs to employ a sustainability adviser. Condensing the work into one year would cost the city an extra $295,000, for which no budget existed, while doing it over two years instead would still cost $227,500, the report by council corporate policy team manager Nicola Johnston said. However, Cr MacTavish said she would be “doing an injustice to the future generations I’m here to try and represent” if she did not fight to have the pace of the work increased. “Yes, at least they tried”, she argued. Her pleas won support from a majority of councillors, but not Cr Syd Brown and a sceptical Cr Lee Vandervis, who both worried about the extra cost involved. Cr Brown could not justify the extra burden on ratepayers given advice from University of Otago emeritus professor of geography Blair Fitzharris, a climate change expert, that the council would have “plenty of time” to prepare. Cr Vandervis also poured scorn on Cr Kate Wilson’s suggestion the council should be seen to be leading research on climate change, describing the position as “hysteria” and “completely and utterly unbelievable”. He believed much of the work could instead be carried out free of charge by University of Otago graduates on the council’s behalf. However, Cr MacTavish’s pleas appeared to sway Mayor Dave Cull, who initially indicated he supported starting the work with a three-year timeframe, but with the option to review progress after 12 months. When it came to the vote, however, he switched his position to support Cr MacTavish’s recommendation. Councillors voted 7-4 in favour of accelerating the work. 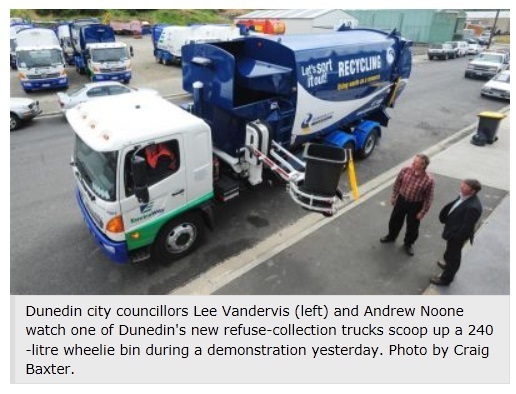 A fleet of shiny new rubbish trucks set to hit Dunedin’s streets next month have been showing off their capabilities. EnviroWay – a division of EnviroWaste Services – has bought a fleet of 16 new collection trucks worth $5 million from manufacturers in Auckland and Hamilton. The fleet, along with a 17th truck already owned by the company, will head out on Dunedin’s streets from February 28, when the Dunedin City Council’s new kerbside collection service begins. Yesterday, the first 12 vehicles to arrive in Dunedin were inspected by Crs Andrew Noone – chairman of the council’s infrastructure services committee – and Lee Vandervis. Council and EnviroWaste staff were also on hand to demonstrate the trucks’ ability to scoop up the new recycling wheelie bins, with the driver operating a mechanical arm. The observers were intrigued by the larger trucks’ specially-adapted rear axles, which allow the rear wheels to be turned, providing a much tighter turning circle. EnviroWaste operations manager Vaughan Adams said the trucks ranged in size from 4 to 12 tonnes, and were capable of carrying between8cu m and 29cu m of rubbish, mixed recycling or glass. The vehicles were being built in Auckland and Hamilton. The remaining four are due by February 1. Meanwhile, the council has called in three extra staff to deal with a flood of phone calls about the new recycling service. Council customer services agency manager William Robertson said more than 1200 calls had been logged in recent weeks, many querying why bins had not arrived. Council solid waste manager Ian Featherston said about 30,000 of the 44,000 wheelie bins due to go out had been delivered. The performance of a second Dunedin City Council department is to be reviewed, as the council continues its hunt for operational efficiencies. Councillors at the 2011-12 pre-draft annual plan deliberations on Friday voted to review the practices of the council’s development services department, which covered animal control, building control, environmental health and liquor licensing. The move was proposed by Cr Syd Brown, chairman of the council’s finance, strategy and development committee, who said it would be about “shaking the tree” while examining council processes. It was the second review approved by councillors during the pre-draft annual plan hearing. Cr Brown pushed successfully on Thursday for a review of the council’s economic development unit (EDU) . At the time, Cr Brown said the EDU review was among several he planned to recommend, alongside a drive to find savings within council capital expenditure. The details of the reviews would be brought to the council’s planning and environment committee for approval before beginning. Cr Fliss Butcher again questioned the cost of a review, having also done so on Thursday, but the latest review won support from councillors. Cr Lee Vandervis said he had fielded public complaints about the department’s processes for builders, including one from a man hoping to add a small toilet to a garage he was building. “He ended up having to have 14 separate visits from building inspectors – 14 visits for a garage. Cr Richard Thomson agreed, saying the Central Otago District Council had already enjoyed success in reducing the time it took to issue consents after a review. Cr Andrew Noone said he was comfortable with a review, but reminded Cr Vandervis councils were now required to comply with a host of rules that previously did not exist. Council chief executive Jim Harland said he had confidence in the practices in place, and had “no problems” with a review of any council department. “While there’s always room for improvement, I’m confident the basic practices we operate are sound,” he said. The Dunedin City Council would need to take on unions over working hours and other conditions if it hoped to keep water services in-house while slashing costs, yesterday’s hearing was told. Councillors were given the blunt assessment during yesterday’s pre-draft annual plan hearing, while debating the proposed new council-controlled organisation (CCO) to manage the city’s $1.6 billion portfolio of water assets. “I wonder what we as a council are doing that we can’t get those efficiencies and drive it?” Cr Kate Wilson said. However, council city environment general manager Tony Avery said an “enhanced status-quo” was one of three options considered during the review of the council’s water and waste services operation. Enhancing the existing council operation would keep services in-house, with an advisory board established to help streamline operations, and would generate some – but not all – of the benefits of a CCO. Mr Mackie said estimated savings of $564,000 a year could be achieved by streamlining the council’s in-house operation. However, that would require “very, very tough conversations with the unions” about restructuring, working hours and other conditions, which the council had historically “backed away from”, he said. It could be done if the council was prepared to “tough it out”, even at the risk of industrial action and possible fallout for the city, as was taking place in parts of the United Kingdom, he said. “That’s the sort of calls being made elsewhere,” he said. Cr Chris Staynes said the council was a big organisation but appeared not to have “the balls” to manage the business as it would be in the private sector. “That worries me,” he said. Council chief executive Jim Harland said the move would be a “valuable technique” but budget reviews and pressure to find greater internal savings had already been carried out, identifying savings of $4 million for 2011-12. Mr Avery said a further reduction would be a “challenge”, but spending on some discretionary items, such as modelling for climate change, could be cut if required. Other councillors supported the CCO’s benefits, with Cr Lee Vandervis saying they would help eliminate waste and Cr John Bezett predicting an “immediate change of culture” within the organisation would result. Cr Fliss Butcher voted against a proposal to review the council’s economic development unit because of concerns over its costs, rather than abstaining, as reported yesterday. The New Zealand Historic Places Trust (HPT) has been challenged to help the Dunedin City Council beef up a council-administered heritage fund. The council yesterday voted to restore to $80,000 the money it allocates to its Heritage Fund. The pre-draft annual plan had halved it to $40,000. Deputy Mayor Chris Staynes reminded councillors the trust helped administer the fund but that it did not give it any money. HPT Otago-Southland manager Owen Graham this week told the Otago Daily Times the trust did not have the resources to bolster the fund. Even so, Cr Staynes said it needed to be “re-engaged” to lobby central Government to match, dollar-for-dollar, council heritage funding. It would do so for a fund Cr Syd Brown urged, unsuccessfully, to be allocated a pared-down, $40,00 budget. He told councillors it had a sizeable bank balance, and reminded them they started the pre-draft annual plan process wanting to keep rates down. Cr Lee Vandervis, chairman of the heritage fund allocation committee, defended the fund as an increasingly successful incentive to property owners keen to restore city heritage. It had a $482,136 balance but only $129,102 has not already been allocated. Halving its funding to $40,000 would severely restrict what it could do. The fund could not pre-plan for the applications it might receive and it needed to have the cash on hand to react when those applications came in. More applications for potentially expensive work were expected in the wake of the Canterbury earthquake and the demise of the Dragon Cafe building in Rattray St.
Building owners needed help to earthquake-strengthen heritage buildings, and the city needed to be ready to help with seeding funds to make things happen, Cr Vandervis said. 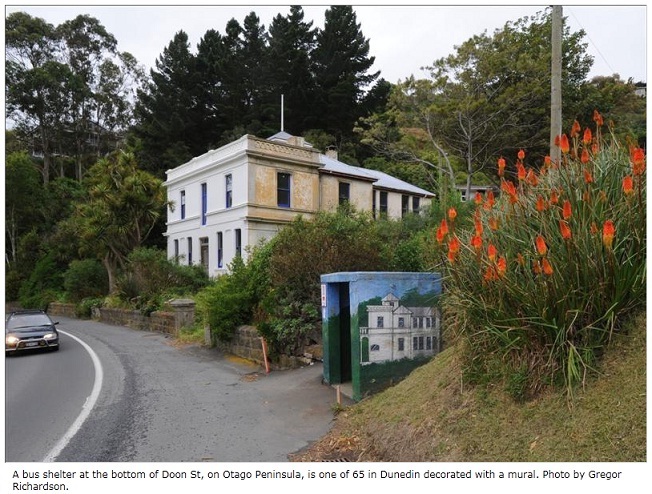 Cr Kate Wilson said Dunedin was leading the way in its renewed commitment to built heritage, but Mayor Dave Cull lamented years of inaction on heritage. The fund showed the city was committed to built heritage and to remove it would be “like saying we didn’t mean it, really, and would not be a good look”. The heritage fund continued to help gather momentum for heritage, and the $80,000 was a small price to pay for keeping that momentum going. It “looks like” the Dunedin City Council owns the city’s 232 bus shelters and it appears the Otago Regional Council has agreed to help fix them. City council staff were last year asked to determine which of the councils owned the bus shelters as concerns mounted about the murals on 65 of them. Many needed repairs – costing, on average, $2500 – but the funding had dried up and it remained unclear which council should take the lead and fix them. Until 2004, the regional council contributed $30,000 a year toward the murals. In 2008, it rejected the mural costs altogether. City council transportation operations manager Graeme Hamilton this week told councillors that the regional council had agreed to contribute $12,500 to the cost of maintaining the murals. That meant the city council could cut its $35,000 mural budget to $22,500, with another $10,000 for maintaining murals painted on retaining walls. Cr Lee Vandervis asked whether staff had also got to the bottom of which council owned the shelters. Mr Hamilton said “my best guess is, it’s probably us”. A 1992 memorandum of agreement says the city would build, own and maintain all bus shelters, and that the regional council would pay to build and maintain them. Mr Hamilton said the memorandum was unsigned but that staff from both councils last month agreed the agreement should be updated. It has been suggested the city accepts ownership of the shelters, and the regional council should continue to fund installation and maintenance. The regional council should also support shelter mural maintenance, equivalent to the maintenance of a shelter without a mural. Cr John Bezett urged a speedy and legally binding resolution. Continued debate was making the council look silly. Cr Colin Weatherall said the murals, many of which were painted by the late Dunedin artist John Noakes, contributed to the character of the city and discouraged vandalism. Parts of the $45.8 million Dunedin Town Hall upgrade have again been sent back to the drawing board, with a redesign under way that could cut costs and kill plans for a cube-shaped glass entrance. Dunedin City Council city property manager Robert Clark yesterday confirmed details of the redesign to the Otago Daily Times, after it was revealed during debate over the council’s 2011-12 pre-draft annual plan hearings. Mr Clark – speaking outside the hearing – said staff were looking at new “design initiatives” for the town hall project, details of which would be presented to the council’s finance, strategy and development committee next month. The review included reconsidering whether the planned glass cube-shaped entry was “the most appropriate solution for an entrance”, but could also result in cost savings being identified within the project, he said. Changes were also being considered for the Glenroy Auditorium component of the wider upgrade project, and minor improvements had already been made to the design of the Municipal Chambers upgrade, he said. It is the latest step in the long-running saga over the town hall project, after an earlier plan for a glass atrium over Harrop St ran into furious community opposition and was abandoned in 2008. That led to a revised design being unveiled the following year, including the glass cube-shaped entrance and other changes, as part of a wide-ranging redevelopment of the town hall, Municipal Chambers and Dunedin Centre. Mr Clark said he had identified design improvements since taking over as project director early last year, following the departure of former council strategy and development general manager Kate Styles. Mrs Styles resigned in late 2009 to take a new management role with Housing New Zealand in Wellington. A review of the original design had been under way for several months, and had identified areas to improve and possible savings, Mr Clark said. He declined to comment when asked about the size of any savings, saying only the overall cost could come down, or the savings could be used to improve other parts of the design. The redesign could include completely removing the glass cube-shaped entrance, or redesigning it to make it a more functional space. Changes to the Glenroy Auditorium were also being considered because concerns had been raised about the impact the original design could have on the facility, he said. “A number of people have concerns that the current recital hall is regarded highly within musical circles,” he said. Much of the town hall upgrade was focused on improving fire systems to meet regulatory requirements, and was to be carried out in stages. Work to enhance and strengthen the Municipal Chambers began last July, and was due to be completed in March. Other elements of the project would follow in stages until the entire complex was completed by December 2012. Plans for the glass cube-shaped entrance were compared to the glass pyramids at the Louvre Museum in Paris, and glass additions to the Reichstad in Berlin, when announced in July 2009. At the time, Eqo Leung, of Opus Architecture, described the design philosophy for the entrance as one of detachment. It was to be attached only where three doors provided access between the cube and the town hall and it would reveal the building’s facade in a much better way than the existing entrance, he said. The cube, which would have “giant pivot doors”, was to be a collection or flow-through point for people visiting the town hall, he said. Details of the redesign emerged after Mr Clark updated councillors on the project at yesterday’s pre-draft annual plan hearing. His update prompted Cr Lee Vandervis – an experienced sound technician – to offer his services on the development’s project delivery team. …we no longer have an utter embarrassment with a glass block on the front of it. When Mayor Dave Cull pointed out Cr Vandervis had previously declined an invitation to join the group, the councillor explained that was because “we no longer have an utter embarrassment with a glass block on the front of it”. Cr Vandervis said he was encouraged by proposed design changes, having become increasingly uncomfortable with plans for the town hall while watching the debate unfold in recent years. He said he was pleased “monumental changes” to the building “were going to be looked at again”. Yesterday, Mr Clark indicated a revised design for the entrance could mean retaining a glass cube of sorts but making better use of space within the cube for functional purposes. More details would be available at next month’s committee meeting, he said. Spending is under the microscope as Dunedin city councillors this week grapple with the 2011-12 budget, with its forecast 6.1% rates increase. Councillors began a two-day public hearing in Dunedin yesterday with some sharp questioning of staff and spending priorities as the pressure goes on to rein in the forecast rates rises. Also emerging were plans to put DCC staff costs under closer scrutiny and revamped plans for the town hall development. Reporters Chris Morris and Stu Oldham report. The Dunedin City Council is turning the microscope on itself, with a review of the council’s property portfolio under way and plans to scrutinise the performance of the economic development unit (EDU). Plans to examine the EDU’s performance were raised by Cr Syd Brown – chairman of the council’s finance, strategy and development committee – at the first day of the Dunedin City Council’s 2011-12 pre-draft annual plan hearing yesterday. Cr Brown said it was the first of a number of reviews he planned to suggest over the course of the hearing. The move came after Cr Brown last week signalled a new drive to find savings within council expenditure, although his focus then was on deferring some capital projects if savings could be identified. Yesterday, Cr Brown said the review should include the unit’s results and whether their performance was the most cost-effective way to help stimulate the city’s economy. However, he was not suggesting the EDU was “broken” – merely that it would be prudent for the council to reconsider the unit’s performance. “It [EDU] is just number one on the list,” he said. 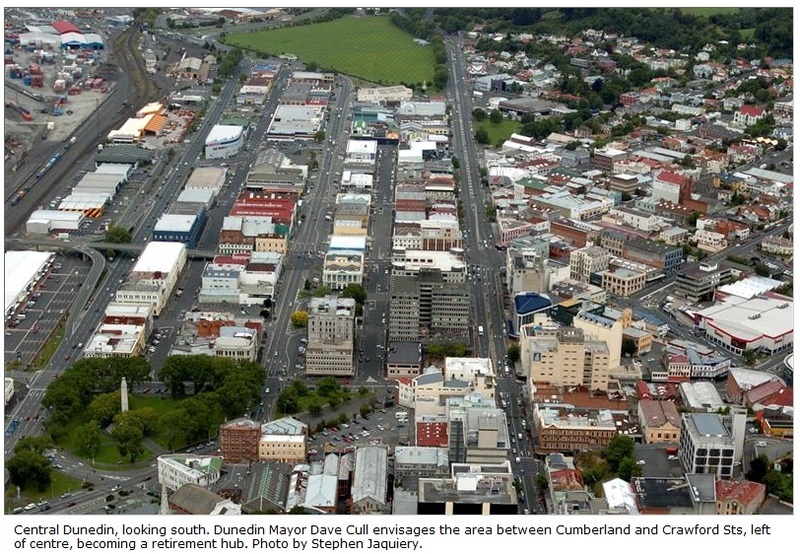 The review would also include the performance of Tourism Dunedin, which came under the EDU’s umbrella, Cr Brown said. Also yesterday, council city property manager Robert Clark confirmed a review of the council’s property portfolio was under way and could lead to some properties being sold. The council’s property assets and investments were worth about $85 million, and together returned a dividend of about $3.8 million a year to the council, but some “secondary investments” were under-performing, he said. A report in March would detail which properties could be sold, and the likely return on sales, he said. Cr Brown’s proposal to review the EDU’s performance triggered debate yesterday, with some councillors criticising the unit while others leapt to its defence. Cr Lee Vandervis argued a 74% approval rating for the EDU in the last residents’ opinion survey was too low “when they are essentially giving away money”. Cr Richard Thomson believed the ability to identify operational efficiencies should be a key criteria in the appointment of a new council chief executive. “I personally believe there’s a range of areas in council that need to be looked at with fresh eyes,” he said. Cr John Bezett also supported the move, saying all council departments should be reviewed periodically. However, he believed it should not be seen as a criticism of the EDU’s performance. EDU manager Peter Harris, contacted after the hearing, said he was not surprised by the move, as efforts to measure the unit’s success in fostering economic development were “open to interpretation”. With other departments also coming under the microscope, “us being part of that doesn’t concern me or come as a great surprise”, he said. The unit and its nine staff, including Mr Harris, together cost about $3 million to run each year, with a portion paid from external funding, he said. The unit’s annual costs included about $1 million distributed to Dunedin companies through industry project grants each year, he said. Staff were also involved in a review of the council’s economic strategy, together with the Otago Chamber of Commerce and other agencies, which began last year. A draft document should be made public by May, and could also lead to a change in direction for the unit, he said. “I think that’s great – we look forward to that,” he said. Council chief executive Jim Harland also defended the EDU’s performance at yesterday’s hearing, saying staff were performing in the “upper quartile”. A review could compare their performance nationally or internationally, carried out by council staff or consultants, with cost ranging from $10,000 to over $100,000 depending on travel requirements, he said. Cr Brown said a detailed review proposal, including costs and a methodology, would be brought to councillors for approval before the review began. Councillors voted to approve the review – except Cr Fliss Butcher, who abstained because of concerns over the price – with details to be presented to the finance, strategy and development committee for approval. The Dunedin City Council already has potential buyers interested in taking a closer look at Carisbrook, and the chances of breaking even on the council’s $7 million deal remain “reasonable”, council city property manager Robert Clark says. However, the council needs to move quickly to ensure the property can be sold before the Otago Rugby Football Union quits the site on October 1, leaving the council to pay holdingcosts of $440,000 a year, Mr Clark has warned. He was speaking at yesterday’s 2011-12 pre-draft annual plan hearing in Dunedin, as councillors voted to proceed with the sale of the stadium and adjoining car park as industrial land. The move would be subject to further public consultation as part of the annual plan process, and was only approved after prolonged debate at yesterday’s hearing. Mr Clark told councillors he would need approval “as soon as possible” to begin marketing the property, or there was a risk a buyer would not be confirmed by October 1. He had already been approached by potential buyers who were “absolutely” interested. He was confident the purchase price of $7 million – which covered the stadium, adjoining car park and residential properties – could be recovered, despite a decline in the market in recent years. This could be achieved by selling the stadium to a single big-box retailer, he said. That was despite the report to yesterday’s meeting recommending a restrictive covenant prohibiting a big-box retail development to protect existing South Dunedin retailers. Mr Clark argued for greater flexibility from councillors, saying one big-box retailer would draw people to the area and increase foot traffic for surrounding smaller retailers. Only a large retail development – such as a shopping mall – containing multiple smaller retailers would harm the area, he believed. However, some councillors voiced objections to the tone of yesterday’s discussion, with Cr Colin Weatherall saying the debate preempted further public consultation through the annual plan process on the stadium’s future. Cr John Bezett said he supported selling the stadium to recoup costs and provide industrial land close to the city centre, but acknowledged others had different views. Council chief executive Jim Harland said the council had already indicated further consultation would be held to consider the stadium’s future, and councillors would be required to keep an “open mind” during that consultation. However, Cr Syd Brown warned a lack of political will to sell the stadium – the council’s stated intention – would leave the council with a $7 million hole in its 2011-12 budget. “That’s a liability of the ratepayers that’s not in our budget,” he warned. Cr Fliss Butcher said it was “a real shame” the council was left with no choice but to sell Carisbrook, but “I don’t really see any option”. Cr Lee Vandervis was equally disappointed Carisbrook had been reduced to a real-estate opportunity, with the council forced to sell because of mounting debt levels. Cr Bill Acklin disagreed, saying debt was not the reason Carisbrook would be sold. It was simply not viable to keep the stadium as a venue for community sports. Mayor Dave Cull supported the sale, saying industrial development could provide jobs for those living in the area. Councillors voted to sell the stadium, but with the price, terms and conditions to be approved by the council before the sale was agreed. The covenant on the land was reworded to prohibit a retail shopping centre, supermarket or multi-big-box development – which would allow a single big-box retail development. The decisions would still be subject to public consultation as part of the annual plan process. City councillors yesterday approved a plan to raise, from July 1, leased parking fees for nearly all its off-street and car park-building parking. If the plan survives the annual plan process, it will cost $2 more per week to lease a park at the Great King St and Upper Moray Pl car parks, and $5 more in Lower Moray Pl. The Station car park will be $9 more expensive per week, the Filleul and York Pl parks will cost $8 more, and those in Queens Gardens, Dowling St and Thomas Burns St will cost $3 more. City environment general manager Tony Avery said the charges, which could be worth more than $130,000 a year to the council, had not been reviewed since 2005. They might appear “bullish”, and they might discourage some users, but they compared well with on-street charges, and were in line with private offerings elsewhere. Definitive figures were not available yesterday but there was good demand and waiting lists in most areas, Mr Avery said. Cr Lee Vandervis said that demand was a “silver lining” to the cloud cast by the demise of free on-street parking. Free parking added to the city’s character and caused fewer frustrations for drivers and businesses, but he acknowledged other councils did not give their parks away. Cr Neil Collins pointed out other councils charged much more and suggested future reviews might consider the new charges too low. Cr Teresa Stevenson lobbied, ultimately unsuccessfully, for councillors to ring-fence the extra income for projects promoting alternative transport. Warned of the precedent that would set, she argued the parkingmoney could be legitimately linked to other, transport-related initiatives. Cr Jinty MacTavish – frustrated by a council agenda chock-full of initiatives to cater for oil-based transport – was “astonished” the council could “not adjust to change”. Mayor Dave Cull said ring-fencing money was the wrong way to develop policy and that motorists might consider it a “punitive impost”. Mr Avery said the money was new revenue – it was not in the pre-draft annual plan – so it could offset rates in any council projects. Cr Stevenson, Cr MacTavish, and Cr Kate Wilson were the only councillors who voted to ring-fence the money. Councillors will this week begin hammering out the Dunedin City Council’s 2011-12 pre-draft annual plan, which forecasts a rates rise of 6.1% for the coming financial year, followed by an 8.9% increase in 2012-13. It is a rates hump that has both Mayor Dave Cull and Cr Syd Brown – chairman of the council’s new finance, strategy and development committee – looking for further savings. However, a suggestion by Cr Brown that delaying big-ticket projects could help trim costs drew both criticism and support yesterday, with councillors appearing split over the idea. Some agreed every capital project should be reconsidered by the new council, while others argued delays would be pointless and potentially costly, or were non-committal, saying only they would consider the merits of any specific proposals. However, calls for the size of the council’s staff and also its operating costs to be scrutinised again, and a proposal to debate selling council-owned assets such as CitiBus, will also be discussed. Cr Kate Wilson said she would raise asset sales during this week’s deliberations, which would include a private workshop on Wednesday and a two-day annual plan hearing beginning on Thursday. Deferring capital projects was not the only way to achieve such savings when council-owned companies also aimed to provide dividends to offset rates, she said. “If they [the assets] are to reduce rates, then selling them maybe is an equally valid way of doing that. Cr Richard Thomson’s attention was on council operating expenditure, even after council chief executive Jim Harland’s drive to trim $6 million from costs identified $4 million in potential savings. Cr Thomson said many of the savings appeared to come from cutting grants, services or other council “outputs”, rather than addressing the council’s core operating costs, which required “a harder degree of assessment than has perhaps occurred to date”. “It always worries me when the suggestions for savings are around reductions of services, rather than looking at what is the cost of providing those services and can we do that more efficiently? You’ve got to be convinced that management has done that analysis. Cr Thomson found support from Cr Lee Vandervis, who argued the council’s staff size and spending on consultants was “a fundamental problem”. Deferring capital projects would be “an absolutely weak-kneed, useless response” and proposed minor cuts to service levels – such as reducing library hours – amounted to “tinkering around the edges”. Cr Bill Acklin spoke out against deferring projects, particularly those already under way, saying the focus should be on improving Dunedin, encouraging more people to live in the city and helping it grow. Cr John Bezett said the case for delays would depend on the savings that could be realised, but the council also had an obligation to proceed with projects it had committed to – or consult the public if major changes were considered. Cr Neil Collins supported delays, saying projects like the harbourside plan change and Caversham tunnel cycleway should be put off. Cr Jinty MacTavish said some projects should be delayed until at least next year, when the big picture could be considered as part of the council’s long-term council community plan (LTCCP). The projects could then be judged against those likely to emerge from planning work on climate change and the Your City, Our Future project, she said. Cr Thomson would consider delaying individual projects, such as the Logan Park upgrade, but not projects like the Town Hall upgrade, which would provide additional revenue. Cr Paul Hudson said some projects – such as the Otago Settlers Museum upgrade – involved outside funding. • Wednesday: Councillors’ pre-draft annual plan workshop. • Thursday-Friday: Public pre-draft annual plan meeting for debate and decisions (resuming January 31 if required). • May 4-6: Public hearings (three days). • May 11-12: Annual plan deliberations. • June 7: Council considers annual plan recommendations. • June 27: Council adopts annual plan; confirms rates for 2011-12. Should the DCC consider asset sales to keep rates down? A proposal for a new council-controlled organisation (CCO) to run Dunedin’s water assets has been roundly criticised by two city councillors. Cr Jinty MacTavish said she had “serious concerns” the CCO would reduce public transparency and was unlikely to deliver promised savings of $20 million over a decade. Cr Fliss Butcher also attacked the CCO proposal, which will be considered by councillors as part of 2011-12 pre-draft annual plan deliberations this week. A report by Dunedin City Council water and waste services manager John Mackie recommended a CCO as the preferred option to manage the city’s $1.6 billion in water assets. However, Cr Butcher, a vocal critic of any move towards water privatisation, said the report “means one thing”. Mr Mackie last month dismissed concerns about privatisation, saying council policy ruled out privatisation of water assets. Cr Butcher, who spoke out against an “attempted corporate grab” of water assets at a protest last year, said she opposed any move towards corporate control. Under the proposed structure, the CCO would manage the city’s water assets using the same mix of charges and rates. About 100 council staff would switch to the new unit. The CCO would be a separate legal entity, with its own council-appointed board, reporting regularly to the council. Cr MacTavish was against taking decision-making one step further away from councillors and the public. “We should be looking at promoting models that are very transparent and provide direct links – or as direct as links can be – between the public and decision-making. Most other councillors spoken to yesterday supported establishing a CCO, albeit with some reservations. Cr Bill Acklin said a CCO “certainly does” take direct control away from the council, but annual savings of $2 million were “significant”, amounting to a 2% rates reduction each year. Cr John Bezett said he knew of no councillor who would support water privatisation. Cr Richard Thomson believed promised savings were “likely to be less”, but still of value, and the council would retain oversight of the CCO. Cr Lee Vandervis criticised the move, saying the case for the water CCO was an admission of “the complete ineffectiveness of current council operation”. Cr Paul Hudson said the idea needed further debate, and it was important the council “doesn’t lose control in any way”. David Loughrey > Neil Collins > Johnny CashAs a conduit to some of the biggest names in the entertainment industry, Dunedin city councillor Neil Collins is in a class of his own. The radio and television broadcaster can regale the listener at length with tales of his experiences meeting everyone from “Hot Lips” Houlihan (Loretta Swit) from M*A*S*H to the Beatles and Bill Cosby. But beyond those tales of household names and kings of rock royalty, one story stands out. Because I know the guy who not only met John R. “Johnny” Cash twice, but he once ferried the king of country music to Momona airport in his Ford Capri. Neil takes up the story:”It seems a long time ago now, but at the end of 1972 I travelled to the home of country music, Nashville, Tennessee. “Among the entertainers I’d hoped to meet was the charismatic `man in black’, Johnny Cash. “I got my chance with an invitation to a film premiere of The Gospel Road, which starred Cash, who attended the movie. “After the screening I stood in the foyer of the theatre with a select number of people when Cash appeared. “By now, I had been befriended by a tall Texan who owned five radio stations and a woman who broadcast a syndicated radio news show. “Both knew Johnny Cash personally. “When he appeared in front of me, I was introduced as “a deejay from Noo Zealand”. “I imagined this was how people felt when meeting the Queen or the President. “He was tall, smiling, polite and personable and I was somewhat in awe of him. “There was to be an after-party at the “House of Cash” in Hendersonville, about 20km away, and my new friends insisted I come along with them. “Gold records lined the walls, a recording studio adjoined the lounge and guests sat on black leather furniture. Fast forward to March 16, 1973, and The Johnny Cash Show came to Dunedin. “The legendary Carl Perkins and two of Johnny’s band travelled in my car from the airport to town An enjoyable trip! “I had been asked by the New Zealand promoter to arrange a meal between the two shows at the town hall, and local caterer Nancy Hyndman prepared a feast. “Backstage, Cash appeared moody and distracted but put on a great show. “And I got a prized photo with him. “`Of course,’ I obliged, but explained my 1970 Ford Capri was no limo, as he and his wife climbed into the back, his knees up near his chin, it seemed. “The journey to Momona was mostly a one-way conversation, as he still appeared bothered by something. “So I went for broke, saying how much I enjoyed visiting his home a few months earlier, the fruit juice statue, his movie and playing his songs on the radio. “A puzzled frown at his wife June Carter Cash, and he lent forward as I checked the rear vision mirror. “Apparently he’d been told he was playing outdoor concerts on a percentage fee, but arrived in New Zealand to play smaller indoor theatres. “We got on fine from that moment, and Johnny and June thanked me warmly and politely invited me back to the `House Of Cash’ should I get back to the USA. “I couldn’t stop beaming all the way back to the city. “It was as if I had fallen into a `ring of fire’, and a marble statue of fruit juice had rescued me! What connects an Otago University Students Association capping controller from the early 1980s with celebrated English musician Mike Oldfield, of Tubular Bells fame? These days, this former capping organiser is a lawyer in Dunedin and has written several books about the city, including Dunedin Tracks and Trails, devoted to its many scenic walks. Antony Hamel clearly remembers, back in his student days, first meeting another Dunedin resident – in fact, the co-founder of, and electric violin player (1974-76) with, Dunedin classical rock group Prometheus – who provides the link with Oldfield. Mr Hamel also recalls that Balclutha-born Lee Vandervis, then in his mid-20s, had “a head full of ideas”, including to set up his own sound studio. In those days, Mr Vandervis was fresh from high-level involvement in the international music scene, having worked for several years in England (1976-1981), three years of it as an acoustic engineer and production manager for leading music equipment firm Midas. Midas mobile mixing desks were the most highly prized in the music business, Mr Vandervis recalls. During his Midas years, he rubbed shoulders with fellow acoustic engineers from many rock groups, including Pink Floyd. But it was slightly later, when working for another firm, Red Acoustics, that on two successive days he met Mike Oldfield at his home in a small village, Denham, northwest of London, while showing him some specialised studio speakers. Oldfield was a multi-instrumentalist who played most of the instruments on his landmark debut album, which was also the first released by Virgin Records, and went on to sell more than 15 million copies worldwide. This “musical genius” made an unforgettable impression, with his breadth of musical knowledge, both classical and modern. Very shy, somewhat diffident, Oldfield had a rare gift for empathy, and was both interesting himself and also very interested in a visitor from far-off New Zealand. “I felt like I’d had amazing good fortune – lucky star sort of stuff,” Mr Vandervis says. Oldfield’s house was also memorable, with one room devoted to African drums, and the whole place a “musician’s paradise”. “When Tubular Bells came out in 1973, it completely made him. Not everyone in Ian Powell’s family has been keen to embrace the knowledge they were almost related to notorious con artist Amy Bock. While he can understand that, he finds the story of the woman who was briefly married to one of his great-great aunts fascinating. So much so that the executive director of the Association of Salaried Medical Specialists attended the centennial commemoration of the “wedding” in 2009 and used the story in a speech earlier this year, linking it to the Government’s health policy. He describes his almost great-great uncle (the marriage was annulled and his great-great aunt, Agnes Ottaway, went on to marry twice more) as “an extraordinary person in many ways”. Amy Bock, known to Agnes as Percy Leonard Carol Redwood, married Agnes at Kaka Point in April 1909. Clearly an engaging personality, Bock did not seem to raise the suspicions of those she conned until it was too late. Mr Powell sees her as someone who was oblivious to the consequences of her deception, but not as an intentionally cruel person. Percy was supposedly the son of a wealthy Waikato farming family and nephew of the head of the Catholic Church in New Zealand, Archbishop Francis Redwood. To reinforce “his” persona, he arranged for letters from his “mother” in Hamilton to be sent to the Ottaway family. But even as the wedding went ahead, creditors from Bock’s scams were beginning to surface and the police were not far behind. Percy and Agnes not depart for their honeymoon and that they sleep in separate rooms until everything was sorted out. Five days after the wedding, the police arrived from Dunedin and the family and community learned that “Uncle Percy was, in fact, Aunty Amy”. Bock was sentenced to two years’ jail and declared a habitual criminal, meaning she could remain behind bars until the prison board considered she was sufficiently reformed. She was released in February 1912. Mr Powell considers one of the reasons some family members were reticent about their connection with the “marriage” was the suggestion Bock might have been lesbian. If there was a lesbian connection, “so what?” is his attitude. And how did he manage to link this family connection to health policy? He proudly pointed out in the speech that his grandmother, then Claire Rayner, as a small child, had opened the door of the Ottaway home to Bock masquerading as Percy, and announced that the visitor was a woman dressed as a man. In the same way, Mr Powell argued, if senior doctors and dentists were listened to more and earlier, the country would have a much more effective and fiscally robust public health system. Peter Mackenzie > Chris Amon > Enzo FerrariThe closest I’ve ever been to Enzo Ferrari is touching one of the cars that bears his name, but back in 1984 I had the pleasure of a few laps of the Pukekohe Park Raceway with a driver “Il Commendatore” so admired he hired. That year, Toyota New Zealand released a new front-wheel-drive Toyota Corolla range leaps and bounds ahead of its predecessors, featuring coil-sprung suspension developed for New Zealand conditions by the driver the founder of Ferrari rated as giving the best feedback on setting up race cars – Chris Amon. Chain-smoking Chris, a Ferrari Formula 1 racer between 1967 and 1969, was a revelation at the sunny press day, cheerily helping Toyota prove to New Zealand motoring journalists just how capable the new “Roley” was. Back then, most of the motoring scribes wanted to know what new models could do, pushing them as far as they dared until feedback clearly signalled: “You’re pushing too hard”. Well, they thought, that was their job, wasn’t it? Most had considerable egos. This impelled the dynamics of group driving at model launches into an undeclared show of who had the most nerve. Mostly, you might say, they rated their own driving. That day at Pukekohe, all got the chance to lap the track in the various test cars. The journos generally kept the cars upright and on the black stuff, proving, at least, the latest Corolla was forgiving. There were a few skidmarks before, through and indeed after the hairpin, but generally a minimum two wheels were on the ground. Despite drivers outbraking themselves and overshooting, backing off in the wrong places and sliding off to a teetering halt just short of a roll, there were no injuries or tyres-up finishes. Then, for the lucky ones, it was a run each with Chris, who used the motor right to redline from the word go. So, what is it like to ride with a Formula 1 legend, a man who had the ear and respect of Ferrari? Coming into turns at seemingly impossible speeds, his muscular, crab-like arms and shoulders cranked the steering wheel with precise strength and determination. Kicking the tail out entering the corner to set his powersliding arc through it, he was already lining up the car’s balance to flick back the other way for sliding into the next corner with a vicious downchange. The Castrol corner sign looked imposing when passing it rather sideways and at close range. Sideways again to scrub off speed, full power to steer through the apex, then flat out through the ratios to the next bend, relentlessly on the power and hungry to tackle the next curve for maximum exit speed on to the straight. The remarkable thing is, it felt totally safe and controlled, with Amon’s cut-and-thrust corner-carving hugely aggressive but consistently accurate. That day, more than one journo lost any pretensions of being able to drive, such was the humbling lesson in masterly motorsport skills from the world-class Kiwi legend. Debbie Porteous > Ciaran Brennan > Paul Hewson (Bono)It was 2006 and I was innocently living out of a backpack in Glendalough, Ireland, a small monastic site in a pretty valley featured in such epic films as April Fools’ Day and Reign of Fire. It was peaceful place made up of four main buildings – a hotel, a visitor’s centre, a souvenir shop and, 100m down the road, a Youth Hostel. I worked at the hostel for about a year. Flooded with tourists during the day, the village was left to its own devices at night, when the locals came out for a drink. One of those nights at the Glendalough Hotel, a man wearing a cap was playing a tune. The next night he was at the bar. He said hello while we ordered drinks and we exchanged pleasantries. The barman introduced him as Ciaran and said he was in a band. I inquired which one was that then. And that was about as far as our exchange went, because that appeared to be the wrong thing to say. He muttered that was his sister, sculled a drink and turned away to talk to one of the locals. The barman gave me a wink as I skulked off with my Bulmers. The next night, Ciaran was playing a traditional tune, singing with a local lass, just like any Irish bar on any night. Someone later told me he was a “musical genius”, who had developed a drinking problem and at that time was still dark about some falling out with his sister. The locals treated him as one of them, although there was always a tinge of pride they would casually say “Oh yeah, Ciaran was down t’pub last night”. And the link to the third person is: Ciaran Brennan worked with U2’s Bono. Ciaran Brennan co-wrote, with his brother, the song In a Lifetime, which Clannad performed with Bono. The song, released first in 1986, was one of Clannad’s most well-known songs and is Bono’s most successful solo effort. In another connection with U2, Clannad’s song, Theme from Harry’s Game, written by Ciaran, his brother Pol and sister Maire was also broadcast by U2 at the end of every concert during their 1983 War Tour, and through to the first round of the Joshua Tree Tour in 1987. When you live in Lake Hawea, the leading lights in the world of fashion are literally a world away. However, as Wanaka reporter Matthew Haggart found out, a link to the world’s best designers and top supermodels can be as close as round the corner. Whether it be a regular phone-call check with the constabulary or a drop-in pint with a local at the Lake Hawea Hotel the supermodels of the world are only two degrees removed. Greg Nolet is more used to walking the beat in his job as a Wanaka police officer, but there was a time when the modelling catwalks of New York beckoned. His brother Peter Nolet had established himself in the Big Apple and was securing regular work as a model for major fashion designers, such as Giorgio Armani, Calvin Klein, and Gianni Versace. The pair grew up in Dunedin before they moved to Christchurch to complete their secondary school education. The family spent their summers holidaying at Lake Hawea and the brothers have now both returned to the area to raise their respective families. Greg decided not to choose a career in the world of fashion, after initially giving modelling a “decent crack”, while based in New York. Uncertainties about when the next paycheck was coming and also the extensive travel demands – often at the drop of a hat – made life difficult, given his responsibilities to a young family, Greg says. However, modelling opportunities have still presented themselves to the Wanaka police officer. He was recently cast in a television advertisement for the Rugby World Cup, which was filmed in New Zealand and is scheduled to screen to a European market. The advertisement has since played on New Zealand screens and feature’s Greg’s young son and another Wanaka local, Sue Richard in the production. As one of the leading male models during his era, Peter Nolet has graced billboards and fronted campaigns for nearly all of the famous international fashion brands. A male contemporary of supermodels, such as Elle Macpherson, Naomi Campbell, Claudia Schiffer, and an emerging Kate Moss, Peter has led a life immersed in the colourful, yet extremely competitive, lifestyle of international fashion. Hand-picked early on in his career by fashion luminaries, such as Giorgio Armani and Calvin Klein, Peter became the male “face” for designer fragances and major photo-shoots during a decade of success. As a model, establishing a successful working relationship with a fashion designer, such as Armani, was about always maintaining a professional standard. “You are representing him and his brand. It’s a coveted contract for any model and comes with big responsibilities,” he said. While “initially” Armani and other such designers as Ralph Lauren were reserved, after a time and as working relationships developed, they became more relaxed and open about themselves. “I suppose in a way you developed a kind of mateship – if you could call it that. You’d have dinner with them, they wanted to know about you, where you came from. You’d have a couple of beers with them in the afternoon. Normal after-work stuff, in a way,” Peter says. The top designers all shared singular goals, but once relaxed they revealed qualities to their personalities, which were often no different to everyone else, he said. “They are singularly committed and dedicated to the world of fashion. They’re extremely savvy businessmen, who lead very interesting lives. But in saying that, so many of them were very, very family orientated. “It can be intimidating to meet them, because they are powerful people and with a single nod they can change your life,” Peter says. The designers would often remark about his Kiwi background. They always said they wanted to get here and visit. Dunedin businessman Stuart Allan is just a hug and a handshake away from noted musician Yehudi Menuhin. The connection is Stuart’s Uncle Frank. “My uncle, Sir Frank Callaway (May 1919 to February 2003), was a New Zealander who initially taught music at King Edward Technical College in Dunedin. “He married my father’s sister Kathleen, who was a concert pianist, in 1942. “Coincidentally, among those he taught at “Tech” were his future sister in law – my mother. “He taught there between 1944-46 and later became Professor of Music at the University of Western Australia in Perth. “During his long and involved career he was also president (1980-1981) of the International Music Council of Unesco. “He was subsequently elected a Unesco Life Member of Honour and honorary president of the International Society of Music Education. He was made an Officer of the Order of Australia in 1995 and he was also awarded an OBE (1970) and a CMG (1975). “He was a Fellow of the Royal Academy of Music and West Australia Citizen of the year (Arts) in 1975. “He was also, I think, president and/or chairman of the West Australian Cricket Council for some years. “Uncle Frank and Yehudi Menuhin were colleagues and personal friends for over 30 years. “Menuhin, a Russian-Jew born in the United States, is considered to have been one of the 20th century’s greatest violin virtuosi. “The pair served on several international committees involved with music education including the UNESCO International Music Council.